is a locally owned and operated natural foods supermarket located in the original Oasis Fine Foods Marketplace building in south Eugene. A wide array of natural, organic, gourmet & local packaged foods. Fresh high-quality produce, emphasizing local & organically grown. Chemical-free meats & seafoods. Full-service counter. Deli kitchen serving sand- wiches, soups, entrees, side dishes & food for events! Quality nutritional supplements, vitamins, tinctures, homeopathics and natural body care items. Over 550 wines from the Northwest, California, & around the world. Over 150 beers, from worldwide imports to regional microbrews. Friendly, knowledgeable, & experienced staff. Time to refill your bulk food jars. Get 15% off all bulk food items during our annual spring sale. While some packaging can shift to alternative materials, even recyclable containers often have a plastic wrap around the food inside. And many packaged items you get now, may also be found in our bulk department. Buying in bulk and cooking with more raw ingredients can take a little getting used to but once your daily rhythms adjust to the smell of fresh baked cookies, a steaming pot of basmati rice, or fresh roasted nuts, its hard to go back. Take advantage of our Bulk Sale. Together we’ll reduce our impact on earth’s limited resources! Earth Day 04.22: get a free stainless steel straw with your $25 purchase. Wednesday, 27 March 2019 Recycle Your Surata Tofu Trays! * All plastic film must be reomved - cut away the edges of the container with scissors. * Containers must be clean, with zero food residue to be accepted by the recycling facility. * Only accepting SURATA tofu containers at this time. Surata will hold onto these until the next available Lane County Recycling Roundup, currently April 7th. Thank you for participating! And Surata for showing manufacturer responsibility regarding their packaging! For other plastics recycling information go to www.lanecounty.org/plasticsroundup. Look for their labels throughout the store, to strengthen our circular economy and support your local farmers and food crafters! School Garden Project Garden Cart Raffle to Support the School Garden Project - $1 Ticket to support their great work. "Since 2001, School Garden Project has worked with more than 70 schools and 10,000 students in Lane County to establish, improve, and utilize gardens on school grounds. The school gardens we serve range in size from small plots maintained by single classes, to gardens on more than one acre that serve as a regional demonstration site of community and school gardening. Visit with the folks that make it all happen on Saturday March 16 at the Project info table from 12-4, during our 14th Birthday Celebration-and join us for cake at 2 too! Wednesday, 30 January 2019 Celebrate Citrus! Celebrate Citrus! While there is a wide array of citrus that we enjoy today, they all evolved from 3 varieties native to the foothills of the Himalayas. Through natural or artificial hybridization over thousands of years, mandarins, pomelos and citrons, are the root of them all. Citrus fruits offer a wide variety of nutrients. Beyond vitamin C, citrus are a good source of B vitamins, phosphorous, potassium and fiber. They’re low in calories and contain flavonoids that can help raise your good HDL cholesterol and reduce the bad LDL cholesterol levels, so they’re heart-healthy too! Celebrate this seasonal bounty and try one of the many varieties of citrus filling our produce aisle today. When I was growing up, there was no Christmas tree in our house until that magic morning. Where my German relatives came from, Santa brought not only presents but a tree full of light to put them under. In ancient European cultures people often brought a living tree into their house at this time of year. The green of the yule tree represented eternal life, even as the sun’s rays grew shorter with each passing day. A stout yule log was often placed in the hearth to shed light throughout the household on the longest night. My kids grew up with a regular Solstice celebration with extended family. Lucina, the goddess of light still shares sweet treats with all who gather, then each person lights a candle, expresses their hopes for the year ahead or thanks for that which has passed, and adds it to the tree of light brought in year after year for the occasion. In Iran, people gather for Yalda night. Together they eat (particularly nuts, pomegranates and watermelons), read poetry, and share stories to ward off evil spirits during the longest night. From Kwanza to Hanukkah, from Krampus to Old Saint Nick, people around the world gather at this time of year to celebrate the return of the light with friends, family, food and revelry. Here at Capella, we’ve got you covered for your next holy day tradition, from handmade candles to local, organic produce to vegetarian roasts or holiday meats. Share the Light! Wednesday, 6 June 2018 Reasons to Grill! This time of year is filled with reasons to grill. Whether it's graduations, Father's Day, or just summer weather, there is no better time to cook and eat outside. Our Meat Department is full of grilling options, from our house made Brats to steaks to fish and chicken, we have all of your grill needs covered. Our hamburger and hot dogs are always great choices. Our staff is always happy to spatchcock a whole chicken for even and speedy grilling,and we are full of good cooking advice. If meat isn't really your speed, grilling brings out the best in fruit and vegetables too. Portobello mushrooms, asparagus and peppers are all delicious options. On the sweeter, side, nectarine and peach halves lightly grilled are magical over vanilla ice cream. Whatever you choose, enjoy those long beautiful summer evenings, deliciously. When we talk about Capella Market, most often we talk about food. We think a lot about food around here, and we have lots of it, so that seems natural. With our minds on food so often, it's easy to overlook the vast selection of Body Care products that we carry. From now through May 22nd, our entire Body Care department, mostly in Aisle 3, is 20% off (while supplies last, no further discount). We carry shampoos, conditioners and styling products, soaps, cleansers and lotions. We have a good selection of toothpaste, mouthwash and shaving cream and a wide variety of skin care products, lip balms, and hair dye. We select our products with care. None of our companies test on animals. Many have natural ingredients, and we carry as many organic products as we can. We carry both large companies, such as Andalou and Tom's, and small companies such as Honey Girl and Dead Sea salt warehouse. Whether you are looking for something new or wanting to stock up on your favorites, don't let this sale pass you by! Please join us for our annual Food Fair on Friday, May 11th, and Saturday, May 12th! We'll be hosting fourteen different vendors who will share their food and drinks with you. In the Willamette Valley, May brings warmer temperatures, growing plants, and the Capella Market Food Fair. It's a chance for us to celebrate the bounty of the place we call home. Over the course of Friday, May 11th, and Saturday, May 12th, we invite lots of local food vendors to come share their products and their enthusiasm for food with our customers. 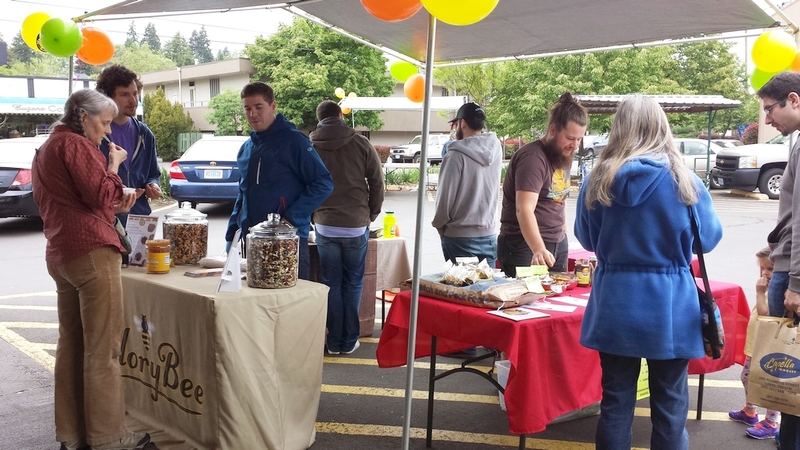 Many of our vendors belong to the Willamette Valley Sustainable Foods Alliance. WVSFA is a local trade organization that helps foster success in local foods businesses through shared values, relationships, education and sustainable business practices. It's no accident that we have so much good food in Eugene and the lower Willamette Valley. Our rich soil and plentiful rain create a bountiful harvest of fruit and vegetables. This harvest leads to other foods, such as honey, and a wide variety of products produced from these crops. By uniting farmers, producers, and retailers like us, Willamette Valley Sustainable Foods Alliance helps to spread awareness that this wide selection of great local foods is rare and precious and should be celebrated. On Saturday, our Meat Department will be grilling Oregon Country Beef hamburgers, and Nearly Normal's Sunburgers for our vegetarian friends. We'll be selling them with chips and a drink for $5. All proceeds will go to WVSFA. We are raffling off a Burley Travoy bike trailer to support WVSFA's efforts. The Travoy is the perfect lightweight and compact trailer for getting shopping done on your bike. Weighing in under ten pounds, it folds down to a briefcase size. It attaches and detaches with ease. The Travoy comes with tie down straps and a tote bag, but Burley makes many different accessories that can be added later, from bags in every size to a rain cover to a rack mount. The Travoy is a $249 value. We are selling raffle tickets for $1 apiece. The drawing will be held on Saturday, May 12th, during the Food Fair. You need not be present to win. Come celebrate spring, local foods and biking weather with us! Recent news about recycling plastics has left many of us feeling helpless. In the past few days it's been announced that there will be no more recycling of plastics, including tubs (such as yogurt containers). How do we cut down on the amount of trash that we are producing while still feeding ourselves? The timing could not be better for our annual Bulk Foods sale. Buying in bulk allows you to buy fresher ingredients, in the exact quantity that you need, with a minimum of packaging. We sell bulk herbs, spices, teas, oils, grains, dried fruit, cereals, coffees, pastas, flours, candies, and much more. You are welcome to bring your own clean containers or use the ones that we have here. We even have glass jars available for purchase that can be filled with bulk products. If you are bringing your own containers, be sure to stop by the front end before you fill them up so that we can weigh the container. We'll subtract the amount of the container from the weight at the register so you are only paying for the amount of the product that you are buying, not for the weight of the packaging. Sunday, April 22nd, is Earth Day! 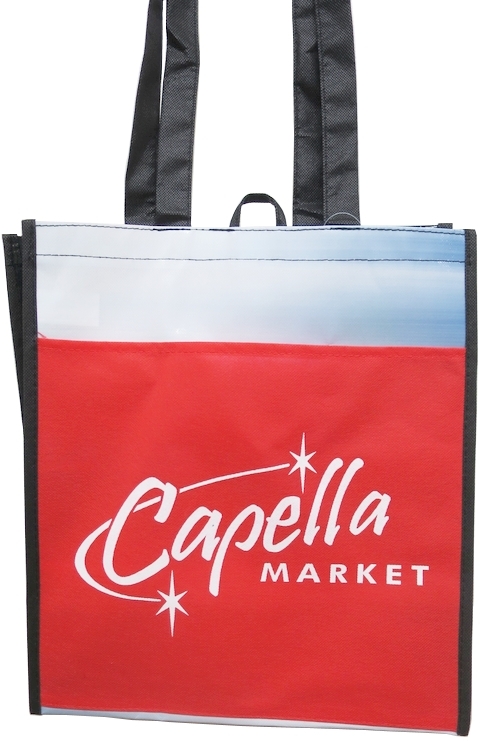 With each purchase of at least $50.00 on that day, we'll give away a heavy duty vinyl Capella Market shopping bag. These bags are built to last, and cut down on the amount of paper and non-recyclable plastic that we use. With some advance planning, we can make a huge impact in how much trash we are generating. Come check out our Bulk Department and take 15% off until April 24th! While the weather outside is changing from wintery to sunshine, inside Capella Market there are clear signs of spring. 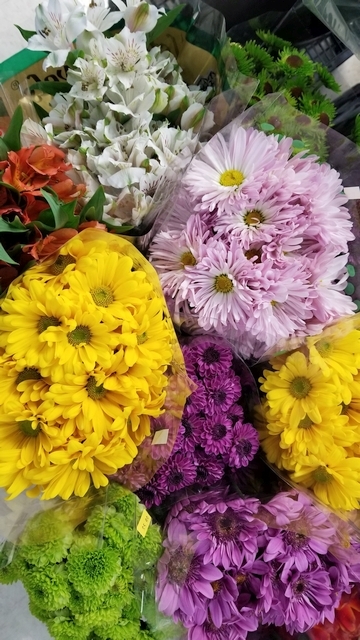 Our Produce department has an abundance of flowers to beautify any table. 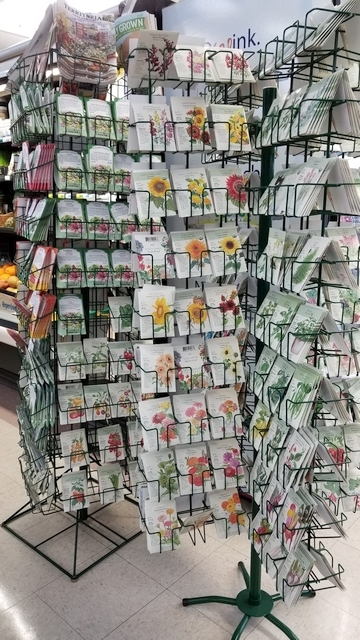 We also have a large selection of seeds from Territorial and Botanical Interest to serve your planting needs. In our Meat Department you'll find leg of lamb and turkeys if you are feeding a large crowd for either Passover or Easter. 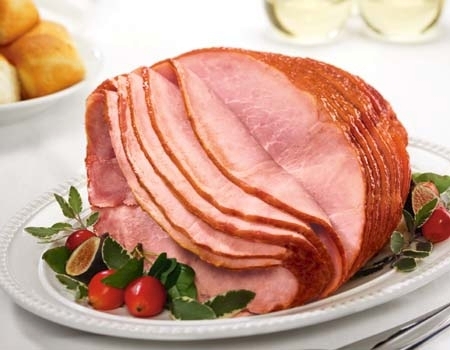 If you are looking for spiral cut ham for your Easter table, we have you covered. Spring also means an increase in the local eggs that we carry, perfect for cooking, baking and dying. Speaking of eggs, our Easter candy selection will delight chocolate lovers. Whether sunny or rainy, we have lots of different ways to help you celebrate spring! 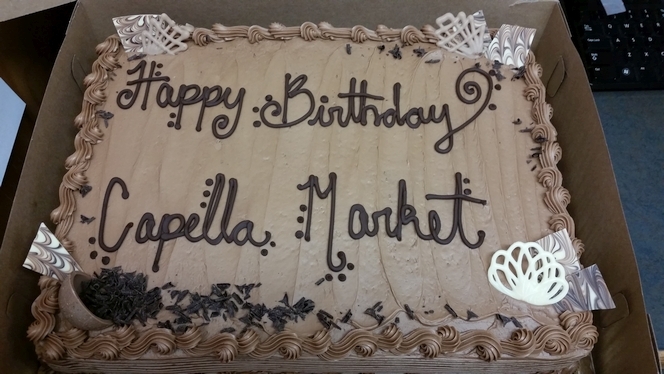 This weekend marks Capella Market's thirteenth birthday, and we are celebrating with our annual Wine Sale! On Friday and Saturday, March 16-17, we are offering 15 % off all wine in stock (while supplies last; no further discount). We'll have wine tastings both days. On Friday we'll have wine tastings from 2 p.m. to 6 p.m., and our Deli will be doing a demo from 3 p.m. to 5 p.m. On Saturday, we'll have birthday cake at 1 p.m., a Deli demo from 2 p.m. to 4 p.m., and wine tastings from 3 p.m. to 6 p.m. There is still time to buy $1 tickets for chances to win the Vitamix E320 blender! Second prize is a $25 Capella Market gift card. The proceeds from this raffle will benefit our friends at School Garden Project of Lane County. They will be here on Saturday to talk about their work. We will draw our raffle winners at 3 p.m. You need not be present to win. We're in!! The nomination phase for The Register-Guard's Readers' Choice Awards is over, and thanks to you, Capella Market has advanced to the voting phase, which goes through March 11. It would be awesome to have your vote! Go to readerschoice.registerguard.com, scroll down to the categories and click on the "Merchants & Retailers" photo. You can vote for us in the "Natural Food Store" and "Grocery Store" categories. Thanks!! Thursday, 15 February 2018 Benefit Raffle for School Garden Project: Win a Vitamix! While there are many different theories about what's good for kids, it would be hard to find anyone who thinks that time outside learning how to grow food is bad for them. The School Garden Project of Lane County gets kids outdoors and teaches them science through growing food. Since 2001, School Garden Project has worked with over 70 schools to create, maintain and educate in gardens. They provide not just educators, curriculum resources and professional development for teachers, but plants, too. We at Capella believe that this organization is a win for kids, for schools, and for the future of our planet. That's why we wanted to help! 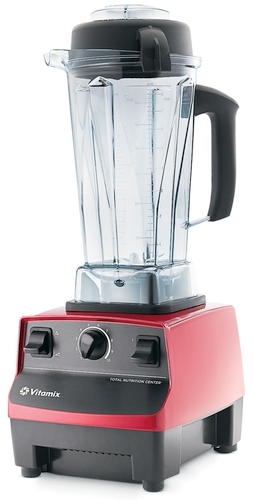 We are raffling off a Vitamix E320 blender to benefit School Garden Project! With a 64 ounce container and a 2.2 HP motor this machine can fulfill some rigorous blending and ice crushing needs. Tickets are $1.00 each. The drawing will be held during our annual Wine Sale at 3:00 pm on Saturday, March 17th. You need not be present to win. Come support a great cause and get a chance to win a great appliance. Wednesday, 7 February 2018 Citrus Fest 2018! The selection in our Produce Department lately is as sunny as today's weather, which is to say, very sunny! 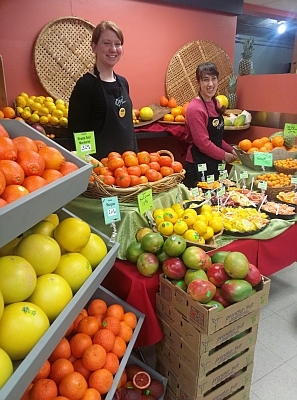 We have many different varieties of grapefruit, oranges and tangerines. For those who like the more exotic fruits, we have kumquats, blood oranges and Buddha hands. If you have been stuck in a citrus rut or have always been curious to try something new, please join us this Sunday, February 11th, from 12:00pm to 3:00pm for our annual Citrus Fest! 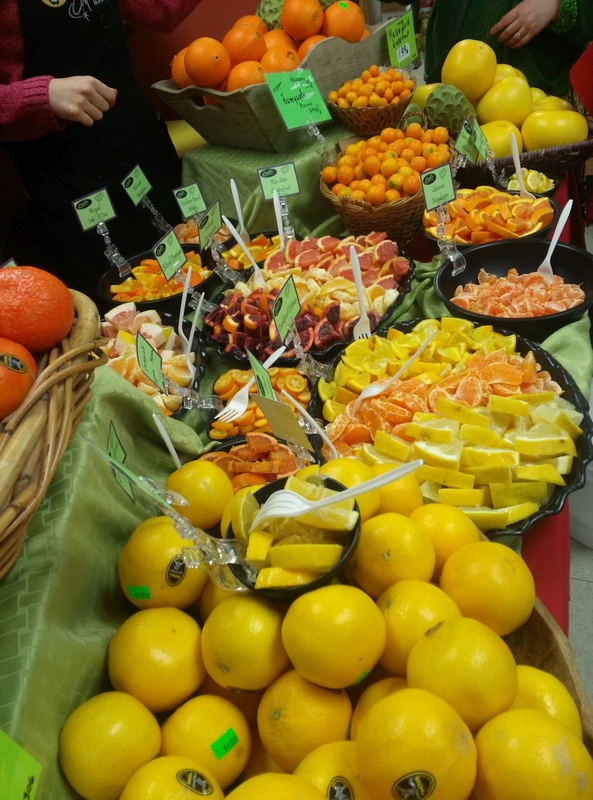 Our Produce Department will be sampling a wide variety of citrus to tickle your taste buds and satisfy your curiosity. While you are here, enter to win a basket of citrus! We'll draw the winning name at 3:00pm. You need not be present to win. We'd love your support in the 2018 Readers' Choice Awards voting. Nomination phase goes through February 11. Go to http://readerschoice.registerguard.com, scroll down and click on the "Merchants & Retailers" photo. Nominate us in the "Natural Food Store" category. Thank you! As 2018 begins, it's time to take stock of the year that we are leaving behind. We are grateful for our wonderful customers and all of the organizations that make Eugene such an amazing place to be. It takes a lot of work and vision to build a great community. We feel so fortunate to live in a place with so much energy and attention and engagement. Through our donations and the money that customers raised by buying raffle tickets and barbecue lunches, we were able to donate over $6,500.00 this year to community organizations. To request a donation for your organization, please submit your request in writing sixty to eighty days in advance of your event. You may either drop off your request here at the store, or email it to capellamarket@gmail.com. It's time again for our annual food drive! For the seventh year, we are working with St. Vincent de Paul on Neighbors in Need, a food drive that puts healthy food into the hands of people in our community. As in previous years, we are offering two different sized donation bags. The Protein Power Pack has crackers, peanut butter, beans and tuna and is priced at $10.00. The Pantry Stuffer Food Pack contains peanut butter, crackers, a can of chili, a can of beans, a can of vegetables, one of tuna, a jar of pasta sauce, and a package of pasta. The Pantry Stuffer is priced at $20.00. Here's how it works: We prepack two different sizes of grocery bags. When you come in to shop, you can choose to purchase either size bag. Pay for the bag at the front end along with your groceries and put it into the donation bin on your way out the door. Neighbors in Need will run through the first of the year. November is here, and within the blink of an eye, so too will be Thanksgiving. Let our Meat and Deli Departments help out this holiday season by pre ordering your turkey from our Meat Department and purchasing sides from our Deli. On Saturday, November 11th from 12pm to 3pm, our Meat and Deli departments will be offering samples of turkey, ham, and almost all of our holiday sides. If you are a person who loves to create an artful pie or a lovely hors d'oeuvre tray but hates peeling potatoes and chopping onions,we are here for you! Our Deli makes Mashed potatoes, Candied Sweet Potatoes, Green Beans and Chanterelles, Cornbread and Chestnut stuffing, and Sourdough and Sausage stuffing. In addition, we offer Cranberry Chutney, Mushroom Gravy and Poultry gravy. All of these items can be preordered through our Deli and picked up at your convenience starting Tuesday, November 21st. Our Meat Department will roast one of our delicious Diestel turkeys that we'll be sampling, along with a Beeler ham. Call 541-345-1014 to pre-order turkeys, hams, and holiday sides. You'll be thankful for the ease that we can provide this holiday season. Friday, 3 November 2017 Order Your Thanksgiving Turkey Now! It's time again to place your turkey order with our Meat Department! We are proud to offer Diestel turkeys again this year. These birds are shipped fresh, not frozen. They have been humanely raised with a vegetarian diet, and they are antibiotic- and hormone-free. We are selling these slow-grown birds for $2.79 per pound. For those who prefer organic meat, we are offering Heidi's Hens, also from Diestel. These birds have been fed organic non-genetically-modified feed. We are selling them for $4.19 per pound. All turkeys will be available for pick-up starting Monday, November 20. We will be open 8am to 2pm on Thanksgiving Day, November 23. 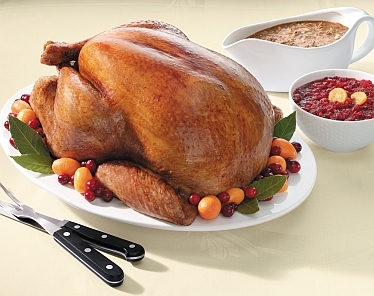 Call the store at 541-345-1014 and ask for the Meat Department to reserve your turkey today! We have had some beautiful fall days lately, with the soft October sun hitting the fiery orange leaves. In our Produce department, that warm orange is echoed in the large selection of squash. Among our many varieties, you will find such exotic beauties as Blue Ballet, Carnival, Kabocha, Red Kuri, Sweet Dumpling, Sugar Loaf and Turban. We also carry old favorites including Acorn, Delicata, Spaghetti and Butternut. If you are curious about some of the larger and more unusual varieties that we carry, please join us this Saturday, October 28th from 12:00 pm to 3:00 pm for our annual squash tasting. This is a perfect opportunity to find out more about how each squash cooks up and consider ways to put a new spark in your fall menus. Here's a recipe from Food52 with a variety of delicious fall flavors to help you appreciate squash and other delicious fall flavors. Two of our favorite things are kids and the great outdoors. We are so appreciative of our friends at Nearby Nature, who do a great job of putting these two things together with great results. Since 1992, Nearby Nature has been teaching kids about the natural world around us, and how easy it is to appreciate the nature right outside our doors. 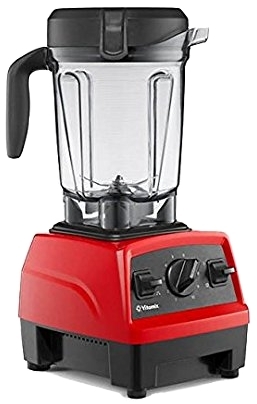 In an effort to support the good that they do in our community, we are raffling off a Vitamix 5300 blender. Tickets are $1.00 each, and all proceeds will go to support Nearby Nature. On October 14th, Nearby Nature will join us as we host our annual Apple Fest. There are so many different kinds of apples, heirloom and new, that it can be intimidating to decide what to buy. 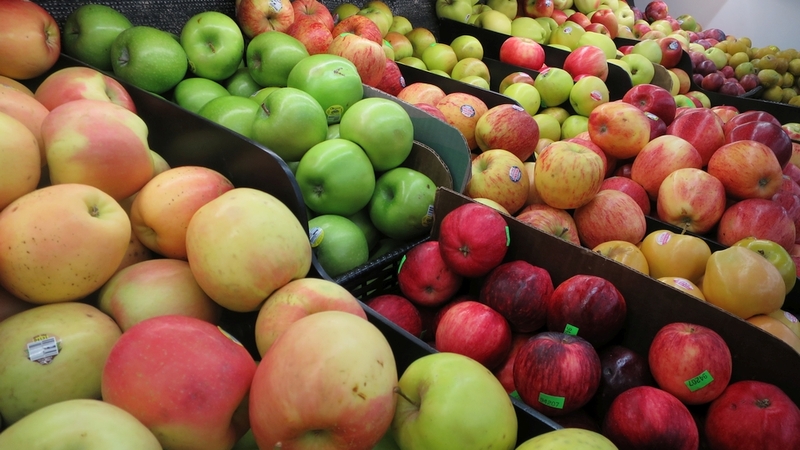 Apple Fest is an opportunity to try a truly astonishing array of apples. In addition to the massive amount of apples, Wildcraft Cider will be here demoing their lovely dry hard ciders, and Willamette Valley Fruit Company will have samples of both their apple and marionberry pies. Our Meat Department will be doing a fundraising barbecue to benefit Nearby Nature. Our menu will be an Oregon Country Beef hot dog, chips and a soda for $5.00. The drawing for the Vitamix blender will be held at 4:00 pm. You need not be present to win. 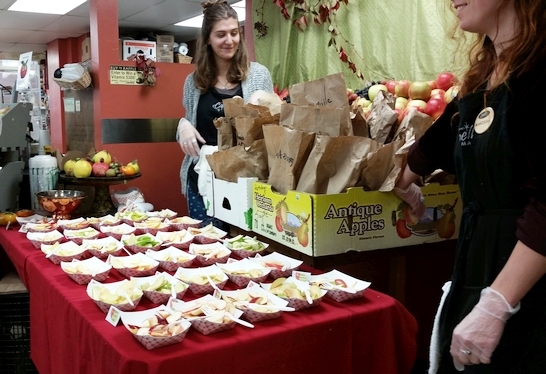 Whether you buy raffle tickets, a lunch, or just come say hi, there are lots of different ways to show your love of Nearby Nature, apples and fall. Raffle tickets are on sale now. Please join us on October 14th. Be sure to come with an empty stomach! 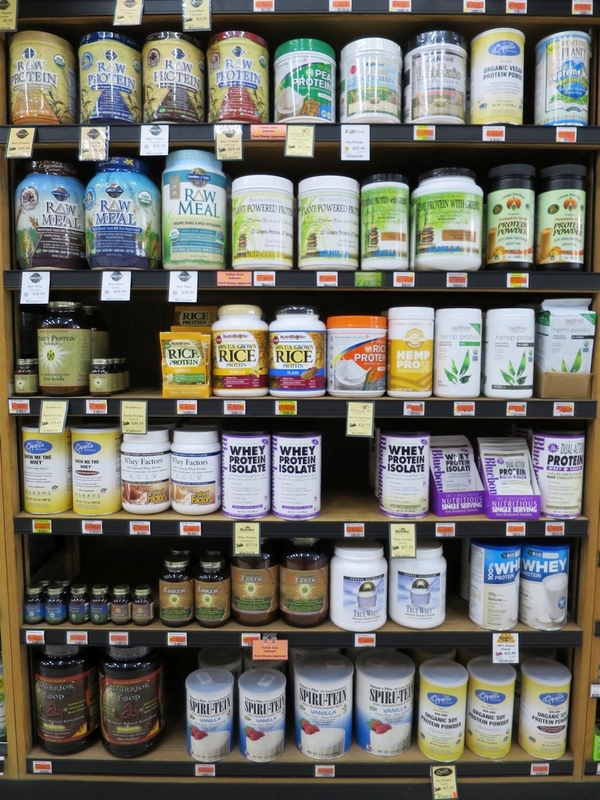 Through Tuesday, September 26th, our entire Supplement aisle is 20% off retail price (while supplies last, no further discount). This includes herbal tinctures and capsules, vitamins, minerals, enzymes, probiotics, omega-3 oils, homeopathics, antioxidants, green foods, amino acids, protein powders and many other products for internal use. This discount applies while supplies last. This is a great time to stock up on all of those items that keep you healthy throughout the year! Our friends at Toby's Family Foods are full of good ideas, and one of them was creating the Sandwich Battle of Eugene to celebrate National Sandwich Month! Our entry this year is Toby's Spicy Turkey. The sandwich has peppered turkey, pepper jack cheese, Toby's jalapeno spread, pesto, mayo, onion, lettuce, tomato, pepperoncini, and roasted red peppers. A whole sandwich is $6.49, a half is $4.49. We'll be featuring the Toby's Spicy Turkey for the month of August, come and get it before it's too late! Many of us can't imagine our lives without pets. They are our dear companions, providing us with comfort, amusement, and love. They share our homes in ways that make our lives richer. For some, when our furry companions become ill, our concern for them can be overshadowed by our fear of the financial burden of getting our loved ones medical care. For many in our community, living expenses quickly exhaust monthly income. An unexpected illness for a person or pet in many households is more than their finances can bear. At Capella Market, we are grateful to have the Community Veterinary Center. This nonprofit veterinary clinic serves low income pet owners, basing what is charged on what clients are able to pay. This important way of supporting our low income neighbors by giving them access to quality pet healthcare seemed to us to be a great cause. 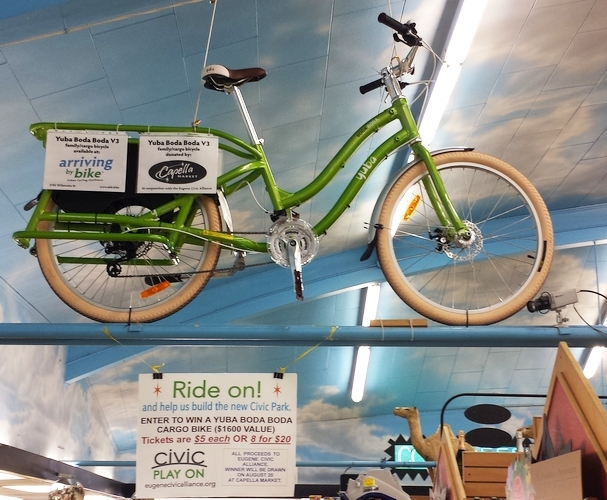 We are raffling a Burley Travoy bike trailer to benefit the Community Veterinary Center. Tickets are $1.00 and are on sale now. This versatile and lightweight trailer is perfect for grocery shopping, errands around town or hauling tote bags for an afternoon at the pool. On Saturday, August 19th, we'll host a barbecue and ice cream social in our parking lot from noon to 3:00 p.m. We'll hold the drawing at 4:00. All proceeds from the raffle, the lunch, and ice cream sales will be donated to the Community Veterinary Clinic. Join us for lunch and buy some raffle tickets! Thursday, 13 July 2017 Friday, July 14th and Saturday July 15th, join us for our Beer Sale! Northwest summers are a time when gardens are growing, kids are splashing in pools, and Eugene feels like it slows down a little bit. July is also the time when we discount all beer, cider and mead for two days. Please join us on Friday, July 14th, and Saturday, July 15th, for our annual Beer Sale! For those two days, take 20% off beer, cider and mead (nor further discounts). We'll have food and beer demos during those two days. On Saturday our meat department will host a barbecue featuring an Oregon Country Beef hamburger, Tim's Chips and a soda for $5.00. We'll also be selling scoops of Alden's Organic Ice Cream (Vanilla, Mint Chip and Cookies and Cream) for $2.00 and Floats for $3.00. 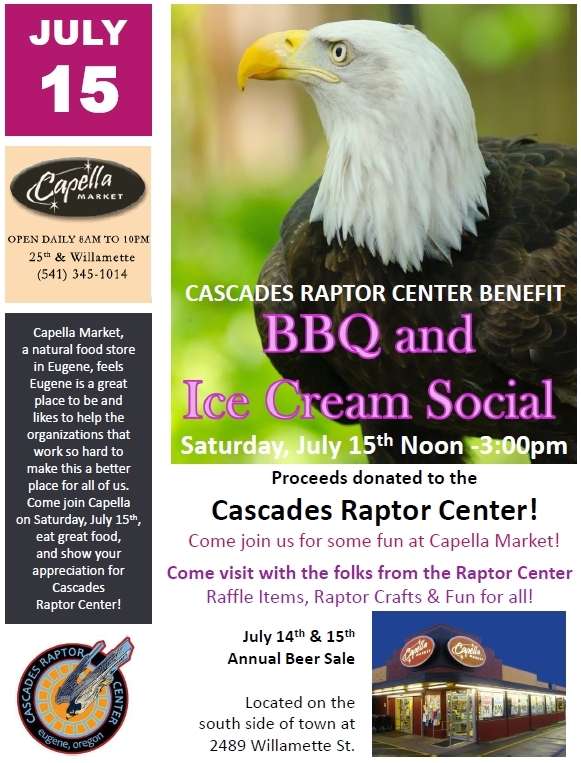 All of the proceeds from our barbecue and ice cream social will be donated to to Cascades Raptor Center. 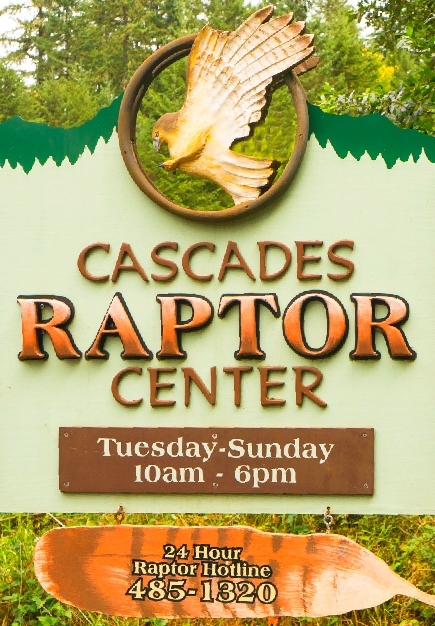 The Cascades Raptor Center will be here with some fun activities for kids and volunteers who will be happy to answer any questions that you might have about the great work they do. 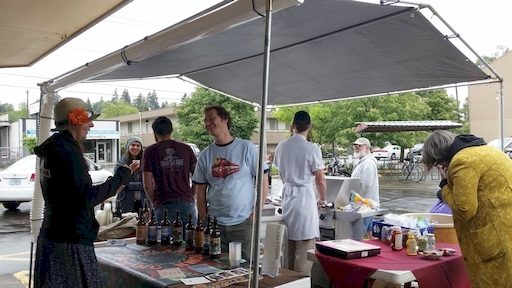 Burgers, beer demos and birds are a winning combination for Oregon summer! Spring has finally sprung, and we are starting to see some evidence in our Produce Department. We have some beautiful nectarines, and a nice supply of pluots. Both of these gems are delicious eaten out of hand, but they are also a nice sweet accent when cut up into a green salad. You could create an elegant cheese plate with a soft cheese, some slices of nectarine, a drizzle of honey and some nuts. If you are a little more ambitious, stone fruit is a lovely addition to two classic and easy baked goods--the upside down cake and the galette. For an even easier (and visually stunning) baked option, an upside down cake is a sure crowd pleaser. While we usually hear about pineapple upside down cakes, this medium is very flexible. From apples to nectarines to berries, the upside down cake is always delicious. Here's a nice recipe that gives clear directions for any fruit. However you enjoy them, nectarines and their fellow stone fruit are a sure sign that spring is in full swing and summer is just around the corner. Our annual Body Care sale is in full swing! We are offering 20% off all Body Care Department products through May 23rd. In addition to soaps, shampoos, and conditioners, you'll find henna, tooth care, lotions, lip balms, cruelty free cosmetics, sun blocks, deodorants, healing oinments, insect repellents, and more. This is a great time to stock up on your favorites! Friday, 10 May 2017 May 12-13: Food Fair and Raffle! There's a lot to be excited about when you think about local foods here in the Willamette Valley. We have great land and creative and hard working people who have a strong vision of how to eat in a way that benefits us and our environment. While we appreciate the bounty of Oregon every day, we set aside two days in May to make our local foods industry the star of our show. The Annual Capella Market Food Fair will be Friday, May 12th and Saturday, May 13th. We'll have over twenty demos going over those two days, allowing you to try granola, chai, mead, vanilla, yogurt, cider, grilled vegetables, beer, and a wide variety of other items grown or crafted right here in the Willamette Valley. Our Meat Department will have a barbecue on Saturday from noon to three. All proceeds will go to WVSFA. Friday, 28 April 2017 WVSFA Raffle: Kitchenaid Pro Mixer! It's time again for our spring raffle that culminates in the annual Capella Market Food Fair! 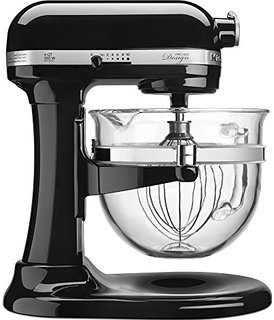 We are raffling off a Kitchenaid 6 Quart Bowl-Lift Professional Mixer. This sturdy tool has ten speeds and five hundred and ninety watts to make all your baking a snap. Unlike some Kitchenaid mixers, the bowl-lift means that you don't have to worry as much about lower hanging upper cabinets getting in the way. Until a person has a stand mixer, it might be hard to imagine why anyone would ever want one. Often counter space is precious, so we make due with lighter weight and weaker hand mixers until the going gets too tough and we turn to elbow grease to mix those heavier doughs. If you had one of the best mixers made, how would it change the way you interact with your kitchen? Would you try things you have always wanted to do but never felt that you had the energy or the time? With such a powerful machine, kneading bread dough is no longer the time consuming and arm exhausting task that it once was. Egg whites billow in no time, cakes are lighter and airier, bread has a delicious chew. Your grandmother's fudge recipe that calls for a half an hour of vigorous beating is no longer out of reach when there are 590 watts and 10 speeds at your disposal. The drawing will be held on Saturday, May 13th at 4:00. You need not be present to win. Tickets are $1.00 and all proceeds go to Willamette Valley Sustainable Foods Alliance, and their new project, Willamette Valley Grown and Crafted. Our annual Bulk Foods Sale begins today! From now through April 25th, we are offering 15% off all bulk foods (no other discounts apply). We are proud of our bulk selection, where we make available many flours, beans, grains, coffees and teas, herbs and spices, granolas, fruits, and nuts. With offerings from Hummingbird Wholesale, Glorybee Foods, Mountain Rose Herbs, Grizzly Granola and many others, the Capella Market bulk aisles allow customers to shop a wide array of local and other high quality foods sourced through local producers. Often the items in our bulk bins are fresher than many packaged goods. They are cheaper because companies don't have to pay for packaging, and one can buy exactly the quantity needed. 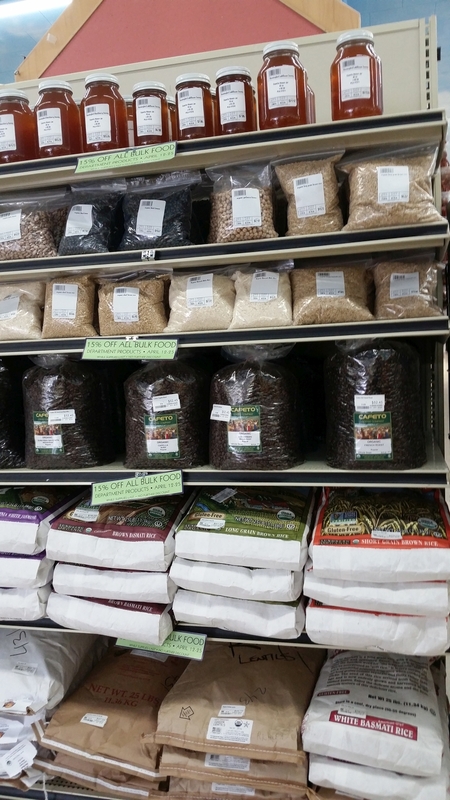 Stop by and check out all our Bulk Foods Department has to offer, and take 15% off until April 25th! 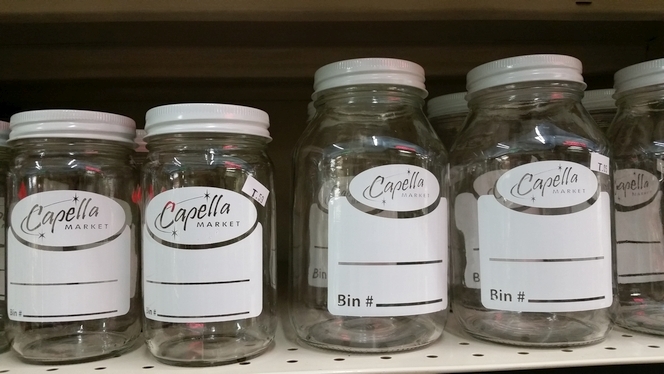 This year, we are introducing pint and quart size glass jars (with lids) featuring the Capella Market logo. They are available for purchase at $1.25 and $2.00, respectively. On Earth Day, April 22, spend $50 in the store and receive a free heavy duty reusable Capella Market shopping bag! Once a year around our birthday, we give our customers the gift of a wine sale. On May 17th and 18th (Friday and Saturday), we'll offer 15% off all wines in stock.On Friday we'll have food demos starting at noon and wine tastings starting at two and going to seven. On Saturday we'll have birthday cake and wine tastings starting at noon and food and wine demos going until seven. 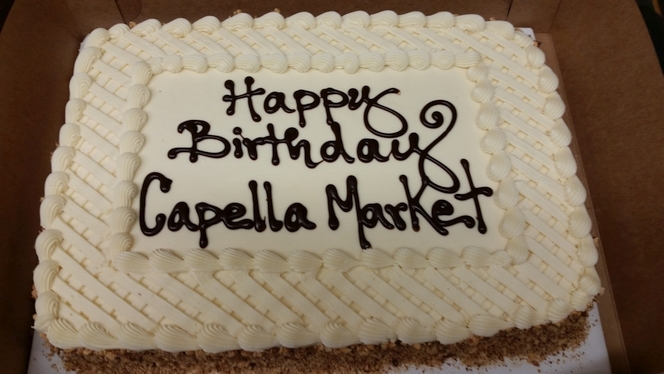 Please join us and help us celebrate great wine and twelve years of Capella Market! By now you might have noticed that we love School Garden Project. It's easy to love an organization that gets kids into gardens and fruit and vegetables into kids. What you might not know is that School Garden Project is delivering science education to participating schools in a way that is effective, exciting, and doesn't increase the workload on teachers. School Garden Project supports schools in several different ways. In their partner schools, volunteers come in to do ten hours of garden education with a specific grade (usually two to three classrooms). Instruction includes planting, weeding, and harvesting, but it also includes STEM (Science, Technology, Engineering and Mathematics) curriculum. The gardens become living laboratories where project based learning allows students to make connections between what they are learning in books and the world around them. Even in schools that aren't partner schools, School Garden Project makes curriculum, garden design, and school specific manuals available so that schools can work on projects such as creating their own gardens, composting, and more. Science education, good nutrition, time outside and learning while having fun are a recipe for success. 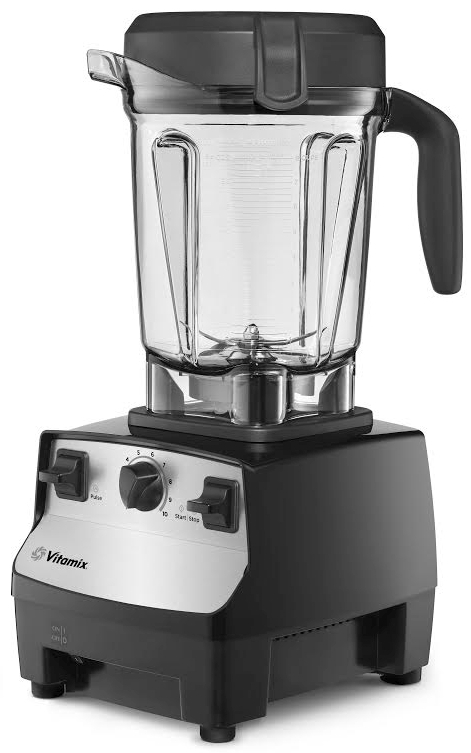 All that good work takes money, though, so we are raffling off a Vitamix 5300 blender to benefit School Garden Project. Tickets are $1.00 each and are on sale now! The drawing will be held during our annual Wine Sale on Saturday, March 18th. It's been a long cold winter already, hasn't it? Between ice storms, blizzards, a vicious flu season and everything else, what's really needed is a dose of sunshine. While we can't count on that in our neck of the woods, we can count an excellent supply of edible sunshine in the form of citrus fruits. 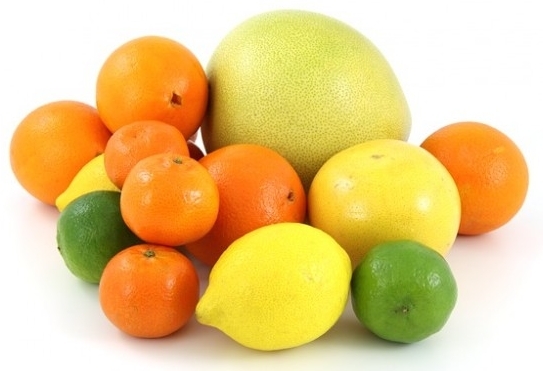 Whether Pomelo or tangerine, these fruits pack a sweet and sometimes acidic punch of vitamin C.
A quick glance around the Produce department this morning revealed twenty five different citrus fruits. We carry the work a day juice oranges, the beautifully colored and sweet Cara Caras, and the ever reliable navels. We have a staggering variety of tangerine types, from Clementines to Minneolas the Lee Nova Mandarins. Seeded or seedless, we have a tiny easy peel option for everyone. In the grapefruit family, we have Pomello, Rio Star, Mellow Gold and Red grapefruit. We also have a nice selection of kumquats. While a lot of citrus is delicious out of hand, there are many ways to include it in baking and cooking. We are all familiar with lemon meringue pie, lemon pound cake, and lemon bars. Many of us have enjoyed lemon curd, and are aware that curds can be made out of other citrus fruits such as lime, orange and grapefruit as well. Citrus juice can add a depth and spark to savory cooking as well. Roasted chicken is good on its own, but with the addition of a whole lemon to the cavity of the bird and lemon zest combined with garlic rubbed on the skin, it becomes something more. Throwing some potatoes and lemons slices into the roasting pan is an easy way to help round out the meal. Lemons can bring out the best in vegetables, too. This recipe from Ina Garten via Food52 is a simple and flavorful way to punch up weeknight broccoli. These suggestions are all heavy on lemon, but there is a whole world of citrus out there waiting to be discovered. Our annual Citrus Fest will be on Sunday, February 12th from noon to three. 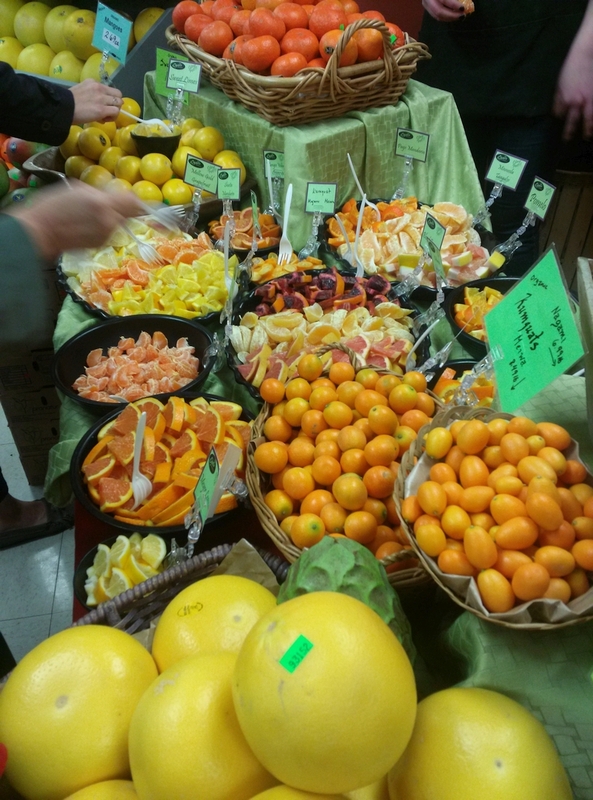 Please join us to sample a staggering array of fruits and choose your favorites. We'll be doing a drawing for a citrus basket at 3:00. Our Customer Service end base is overflowing with Valentine's gifts that are sweet in every way. We are carrying beautiful chocolates from Sjaak's Organic Chocolate Company. For a little treat, we have chocolate heart lollipops, a heart shaped polka dot box made out of chocolate and filled with gummies, and a almond butter filled chocolate hearts. For a larger chocolate gift we have several lovely assortment boxes sized to please smaller or lustier chocolate appetites. Sjaak's is a family run business, and they make their chocolates using only Organic, Fair Trade, Non-GMO and Vegan ingredients. What's not to love? Our Wine department has a lovely selection of sparkling wines to go with your celebratory meal. Our Natural Health department can help round out the evening with candles, massage oils and soaps. 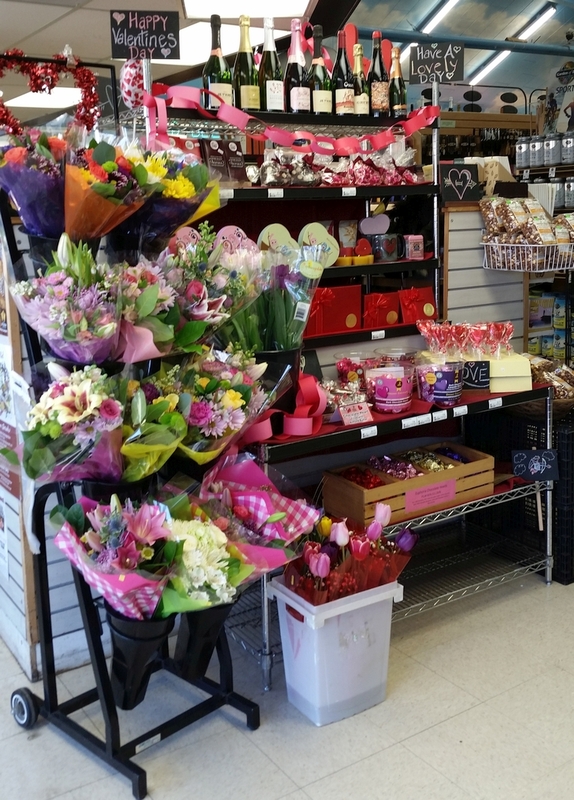 All of this is accented by a beautiful and fresh selection of flowers from our Produce department. However you choose to celebrate Valentine's Day, we are here to help share the love. As we pause to look back on 2016, one of the things that stands out is how much we love our community. Eugene is a great place to be, and we like to help the organizations that work so hard to make this place better for all of us. While we can't grant every donation request that crosses our desk, we try hard to donate to as many as we can. Here are most of the organizations that we were able to help this year. You all have our sincere thanks for making our community a safer, kinder, more beautiful, healthier and more fun place to live. If you would like to request a donation from Capella Market, here's some helpful information. We have a monthly budget. Please give us six to eight weeks in advance of your event. Last minute donation requests are less likely to be granted. Donation requests can be dropped off at the store, or you can email your request directly to reisa@capellamarket.com. Our Meat Department offers excellent quality meat and excellent customer service all year long, but at the holidays, they shine even brighter. This time of year, we bring in all kinds of things to make your holiday parties and meals even more special. 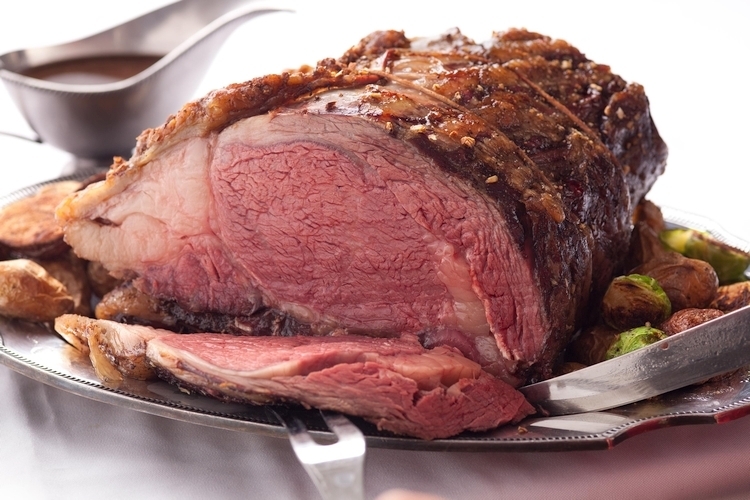 Whether you are interested in Prime Rib, Organic or Smoked Turkey, Peking Duck, or Boneless Ham, we have the right offering for your celebration. 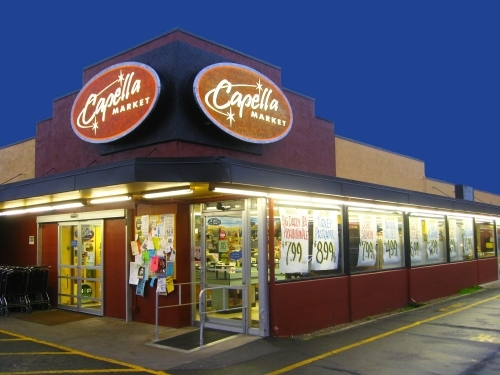 To be sure that you we have what you want when you need it, please call the Capella Market at 541-345-1014 and ask for the Meat Department. It's time again for our Neighbors in Need food drive! The holidays are a time of joy and celebration for many, but for some in our community it's hard to feel joyful when you are worried about feeding your family. Six years ago, after a regular customer made a suggestion, we created Neighbors in Need as a way of spreading comfort and joy to members of our community who need a little help. Here's how it works: We prepack two different sizes of grocery bags. When you come in to shop, you can choose to purchase either size bag. Pay for the bag at the front end along with your groceries and put it into the donation bin on your way out the door. All of the food donations are distributed through St. Vincent de Paul. - Starting Monday, November 21 (today! ): pre-ordered fresh Diestel turkeys are available for pick up. We are open 8 a.m. to 10 p.m.
- Starting Tuesday, November 22: pre-ordered traditional holiday side dishes are available for pick up at our Deli counter. Store hours are 8 am.to 10 p.m.
- Wednesday, November 23: we are open regular hours, 8 a.m. to 10 p.m.
- Thanksgiving Day, Thursday, November 24: store hours are 8 a.m. to 2 p.m.
- Friday, November 25: we resume our regular store hours of 8 a.m. to 10 p.m.
Wednesday, 9 November 2016 Order Your Thanksgiving Turkey Now! We are proud to carry Diestel turkeys again this year. Founded in 1949, this family owned ranch has a long history of growing excellent turkey. Diestel Turkey Ranch mills their vegetarian turkey feed at the farm, so they are always sure that their birds are fed the very best. They grow a variety of breeds, which allows all of their birds to fully mature, regardless of what size bird you need. Growing time is more time for flavor to develop in each bird, so that's a critical part of why Diestel birds taste so good. These birds are given fresh air and room to roam. All of these things add up to a bird that you can feel good about buying. Diestel turkeys at Capella Market are $2.79 a pound. Our Meat Department is taking reservations now so that you can be sure to get the size that you need. Call the store at 541-345-1014 to reserve your fresh turkey today. All turkeys will be available for pick up starting Monday, November 21st. To sample Diestel turkey and the many delicious Thanksgiving sides available through our deli, join us for our Holiday Tasting Fair this Saturday, November 12th, starting at noon. We'll have a fresh roasted turkey, mashed potatoes and candied sweet potatoes, two different kinds of stuffing, green beans, cranberry chutney and gravy. 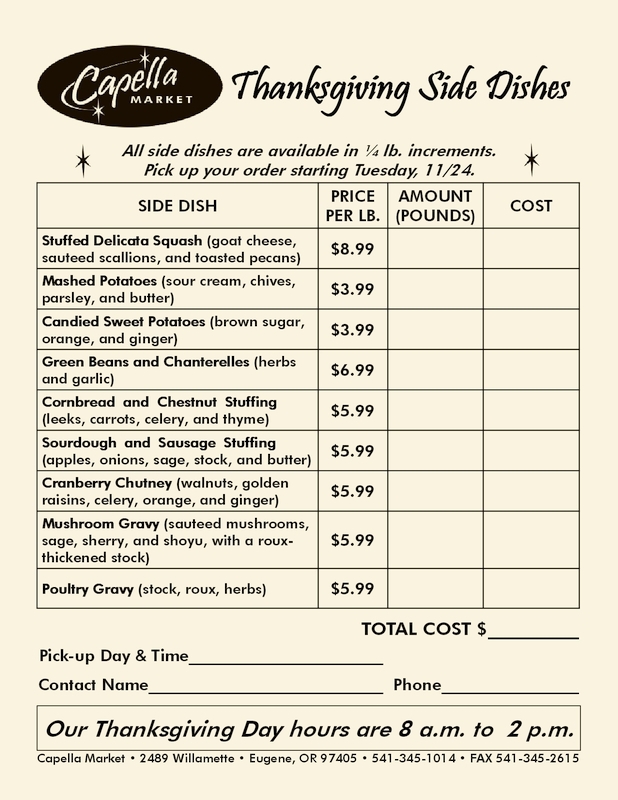 Thanksgiving sides are available to order in advance (stop by or call us at 541-345-1014) through our deli. Please join us on Saturday, October 29, for our annual Squash Tasting! For those of us who haven't loved squash forever, it can be a little intimidating to buy a large squash and hope that we like it. 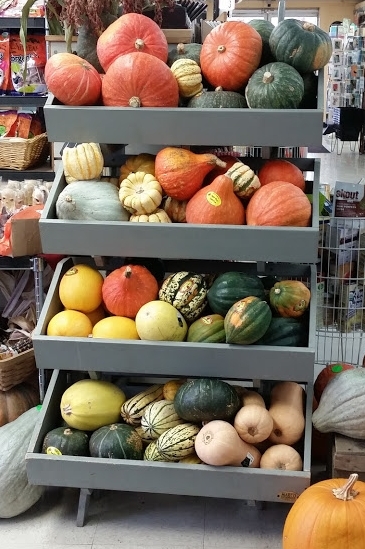 In the Capella Market tradition of being able to try before you buy, our Deli will prepare a variety of squashes stocked by our Produce department. Because we want you to be able to really taste each squash, the preparation is simple, just salt and pepper. We are hoping to taste six or so varieties, including some of the biggest ones that we carry. If you have ever been curious about Blue Ballet, Curry, Hubbard, and others, come check it out. We'll be sampling beginning at noon, and likely wrapping up around 3pm. Thursday, 6 October 2016 Bounty of Apples! It's Fall here at Capella Market. You can tell by the Halloween candy on display, the increased activity around our Vitamin C displays, and by the bounty of apples in our Produce Department. As of this morning there were seventeen varieties of apples packing displays throughout produce, each more beautiful and aromatic than the last. From that workhorse of baking, the Granny Smith, to the exotic Pink Pearl with its striking pink flesh, we have an apple for every taste and application. While many varieties are excellent eaten out of hand, Dorie Greenspan has developed a simple and delicious cake that allows baking apples to shine through. For a less dessert-like but still delicious option, homemade applesauce fits the bill. In this hands-off recipe from Ina Garten, using a variety of apples gives great depth of flavor. We'll be rotating through varieties during apple season. Come in and check out our selection! 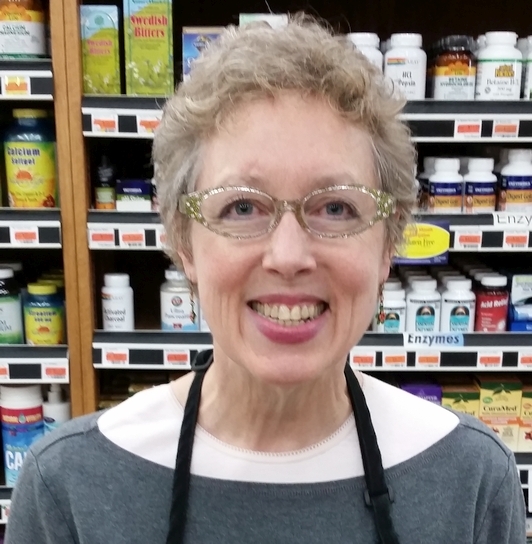 From 11am to Noon, just a half-block south at Tsunami Books (2585 Willamette), our clinical nutritionist and metabolic health specialist Francie Killian, M.S., will present "Why You May Be Better Off Without Gluten." Learn how gluten can promote inflammation and lead to obesity, food addictions, digestive problems, autoimmune disease and other illnesses. What can a healthy gluten free diet look like? What is the difference between an allergy and intolerance? How can gluten initiate "leaky gut," and why is it considered among many health experts to be the biggest dietary gateway to disease? Noon-4pm: Back at the store, we'll be serving up tasty samples of gluten free foods, and several of our favorite gluten free food makers will be here giving demos and answering your questions. ANNUAL SUPPLEMENTS SALE: September 14-27. During this sale, we are offering 20% off all supplements department products in stock (while supplies last, no further discount). Wednesday, 14 September 2016 Benefit Raffle! Our final raffle of the year is upon us. This time we're offering a Vitamix 5300 as the grand prize. Buy $1 tickets for a chances to win it! All proceeds will benefit Parenting Now! (formerly Birth To Three). "Parenting Now! provides parenting education and support to families with young children. We fulfill our mission through direct service to families and sales of curricula and material to parenting educators" (parentingnow.org). Buy as many tickets as you want, to increase your chances! The winner will be drawn on Saturday, October 15, during our Apple Fest. Welcome to the dog days of summer, where kitchens are hot without the help of ovens and stoves. No matter how hot, dinner still has to be served, and the good news is that there are many delicious no heat or low heat options. The other bit of good news is that summer heat gives us the gifts of corn, tomatoes, watermelon, peaches and many other delicious ingredients. Here are some good options for cool meals when it's too hot to think about indoor heat. We have beautiful corn in our produce department from Me and Moore farm. This recipe from Mark Bittman requires no cooking and delivers some delicious summer flavors. Corn paired with fresh mint and tomatoes, along with greek feta from our cheese department makes an excellent light summer meal. Smitten Kitchen has a recipe that involves just a small amount of grilling but delivers a more substantial meal. This recipe for cold rice noodles with lime peanut chicken relies on some core Asian ingredients to give it a flavor punch with minimal cooking. Last but not least, the beautiful simplicity of Caprese salad is a great way to celebrate summer's flavors while beating the heat. This simple recipe relies on beautiful ripe tomatoes sliced about a quarter inch thick. Put a slice of fresh mozzarella on top of each slice of tomato. Slice up fresh basil and sprinkle over the top, then drizzle with a good olive oil and, if you like, some balsamic vinegar. When served with a loaf of Ciabatta bread and a fruit salad, there is nothing better. 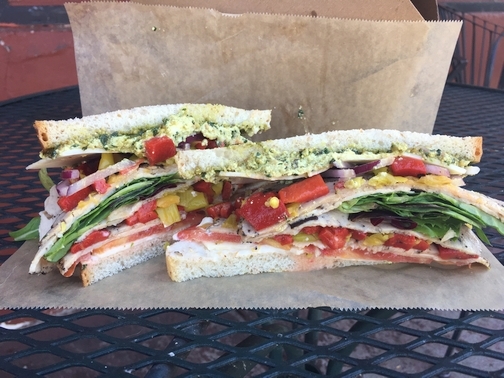 If the thought of even walking into the kitchen is too much, remember that the Capella Market deli offers a wide selection of delicious sandwiches and other prepared foods to help you beat the heat. Hot and hungry? We can help! Wednesday, 17 August 2016 Saturday, Aug. 20: Benefit Ice Cream Social and Raffle Drawing! 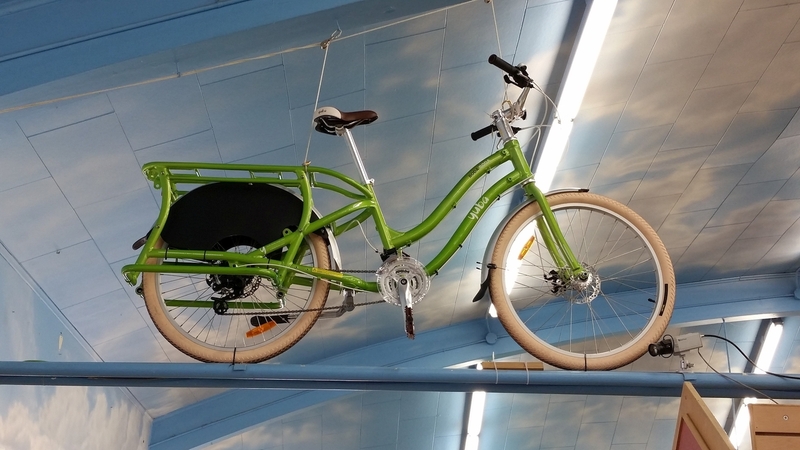 Our Yuba Boda Boda cargo bike raffle culminates in a drawing this Saturday, August 20th. Tickets are still available here at Capella Market, at Arriving By Bike and online at https://www.eventbrite.com/e/eugene-civic-alliance-bike-raffle-tickets-26356140927?ref=ebtn . Because it's August, and we love ice cream, and we also love a good party, we'll be having the drawing at the end of an ice cream social. Our friends at Coconut Bliss and Lochmead have donated some frozen deliciousness and we'll be selling scoops and floats to benefit Eugene Civic Alliance. Scoops will be $2.00, and we'll be making floats with root beer or Hansen's soda for $3.00. In addition, our Meat Department will be giving samples of house made Bratwurst. Eugene Civic Alliance will be here, we'll be cooling down with scoops and floats from 1pm to 4pm, and we'll have the drawing at 4pm. Saturday will be a scorcher. Why not come cool down with some ice cream for a great cause? When we think about causes that Capella Market likes to support, we often choose endeavors that highlight health, community, and getting outside. With these priorities guiding us, finding a way to support the mission of the Eugene Civic Alliance seemed like a slam dunk. Our annual Beer Sale is almost here! On Friday, July 15th and Saturday, July 16th we will offer a 20% discount on all beers, meads and ciders. During those two days we will have many beer samples from your favorite local breweries and food samples from some great local vendors. In addition, on Saturday we will be selling a plate lunch to benefit our friends at Cascades Raptor Center. The sale runs from 8:00 a.m. on Friday, July 15th, to 10:00 p.m. on Saturday, July 16th. Thursday, 16 June 2016 It's Berry Season! Driving along the Willamette Valley's roads it used to be grass fields as far as the eye could see. If you are paying attention, you'll notice that times have changed. From highway 99 to I-5, it's easy to pick out fields full of food. The farmers of the Willamette Valley are turning more of their land over to many food crops including hazelnuts (or filberts, as native Oregonians call them), and berries of all kinds. One of the crops that has proven to be a hit is the magical blueberry. It's an accepted truth that blueberries are delicious, whether eaten out of hand, baked into a muffin, or sprinkled over morning oatmeal. It's also an accepted truth that blueberries are a nutritional powerhouse. A one cup serving of blueberries contains just 80 calories, but holds 25% of our daily requirement of Vitamin C. In addition, blueberries are rich in manganese, which helps our bodies convert carbohydrates, fats and proteins into energy. 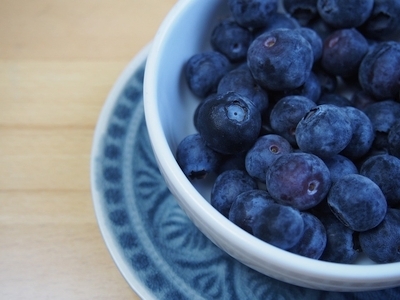 Blueberries are rich in fiber, which is healthy for the heart and lowers cholesterol (the source of this information is www.blueberrycouncil.org). With so many excellent reasons to eat blueberries, we can't leave you without a beautiful pie recipe to help you enjoy everything that these berries have to order. Citrus season has wound down and berry season has yet to get into full swing, but our produce department is in no way lacking fruit to tempt your tastebuds. 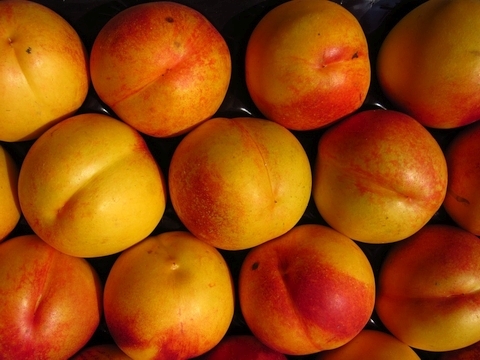 It's the time of year when stone fruit, or drupes, are plentiful and delicious. We have peaches, nectarines, plums, mangoes, and cherries filling up our produce bins. A favorite in recent years has been the pluot, which is 25% apricot and 75% plum, which adds up to 100 percent delicious juiciness. All of these fruits are wonderful eaten out of hand, but if you feel inclined to experiment, the ever helpful Mark Bittman came up with some great ideas that work for all of them. We love our local food scene all year around here at Capella Market, but we don't really shout about it most of the time. Our annual Food Fair is our big chance to make a lot of fuss over our local food and beverage vendors, and there are a lot of them. Whether you are looking for ice cream (dairy or non dairy), salsa, yogurt, beer or coffee, there is an excellent locally produced choice for you. On Friday, May 13th, and Saturday, May 14th, we will be hosting a sampling of deliciousness from many of our local vendors. Organically Grown Company will be here on Friday to grill a selection of vegetables, and on Saturday, our own meat department will be grilling all-beef hot dogs and selling them with chips and a soda for $3.00 each. All proceeds will go to our friends at Willamette Valley Sustainable Foods Alliance. Our raffle of the Kitchenaid Pro 600 mixer ($1 tickets on sale now!) will culminate with a drawing on Saturday in the late afternoon. Join us to celebrate all of the goodness that the Willamette Valley food and beverage scene has to offer! Thursday, 28 April 2016 Benefit Raffle for WVSFA! You may have noticed that we really like food. We get excited about what it tastes like, how it's prepared, and where it comes from. As food nerds, spending time in the kitchen is as much a pleasure as it is a necessity. The right tools can make all the difference in making great meals, and with that in mind, have we got a raffle prize for you! 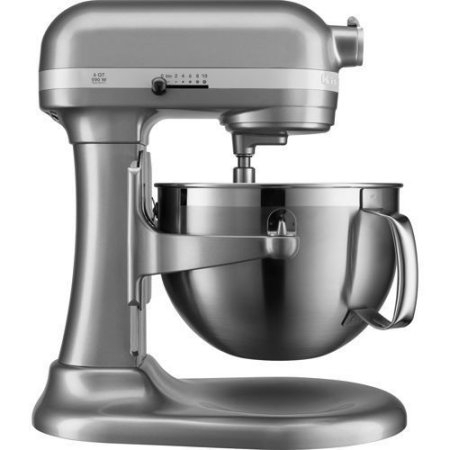 We are raffling off this KitchenAid Professional 600 Series 6-Quart Bowl Lift Stand Mixer ($500 value). The mixer comes with a metal paddle attachment, a whisk and a dough hook. The glass bowl makes it easy to see your ingredients get incorporated. This tool is ideal for bread dough, cookie dough and cake batter. Whipping egg whites and whipped cream is a breeze. The large capacity of the bowl makes it easy to do a large batch or a double batch of dough. All raffle proceeds will go to Willamette Valley Sustainable Foods Alliance. Tickets are $1.00 each and on sale now. Our winner will be drawn on Saturday, May 14th, during our annual Food Fair. Our nutritionist, Francie, will speak on "Mastering Allergies: A Comprehensive Approach" at Tsunami Books (2585 Willamette Street) this Saturday, April 23rd, 1-2pm. Spring has sprung! The sun has been shining, the trees and plants are in full bloom and it feels so good to be outside...until our noses stop up, we start sneezing and our eyes start watering. Welcome to April in the Willamette Valley, an area rich in outdoor beauty and in sources for pollen. Rumors abound that the Calapooia people called the Willamette "the Valley of Sickness" due to the truly wretched allergic reactions that their people had during spring months. For many of us, little is different today. Please join Francie and learn more about allergies and how to live more comfortably with them. 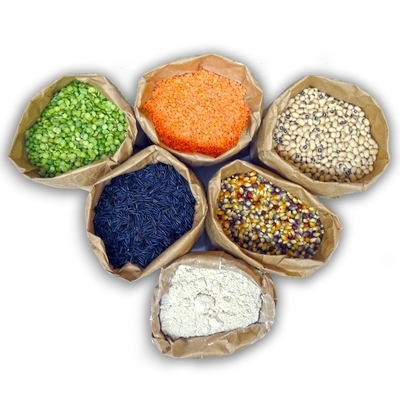 It's time again for our annual Bulk Foods sale! For two weeks, April 13-26, get 15% off all bulk foods department products (while supplies last, no further discount). We at Capella are passionate about buying foods in bulk. It's a way to get the exact amount you need, to try new things, and in most cases to get the very freshest ingredients. We work with some exceptional locally based suppliers to find the finest grains, dried fruits, nuts, herbs and spices available anywhere. We offer locally roasted coffee and locally made granolas, and bulk honey, soy sauce, syrup and oils. 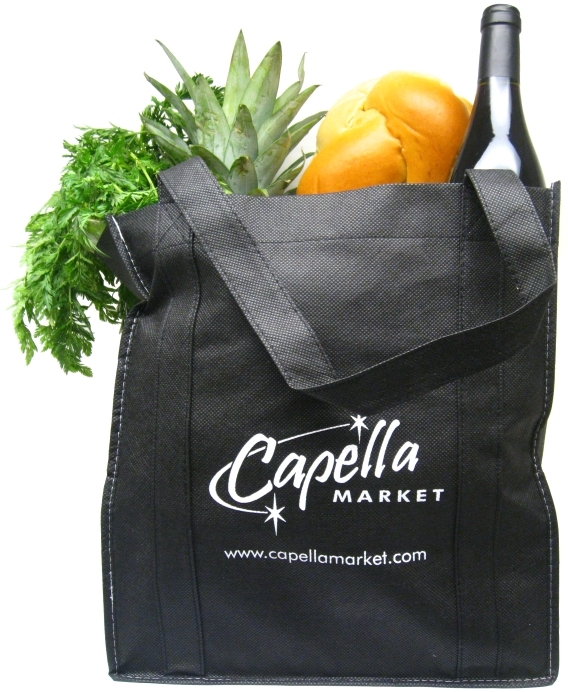 On Earth Day (Friday, April 22), spend $25 and we'll give a you reusable Capella Market shopping bag! This Saturday, March 26, our clinical nutritionist Francie Killian, M.S., will be giving a free talk entitled "Auto-Immune Syndromes: Integrative Approaches for Management and Healing." This seminar will be held from 1 to 2 pm at Tsunami Books, 2585 Willamette (just a half-block south of Capella Market). If you have any questions, call us at 541-345-1014 and ask for Natural Health. Coming up next Thursday, March 31, the medical professionals from Northwest Wellness will be here in the store performing low-cost health screenings, including lab panels and single tests. For information on available tests and any preparation needed (e.g. fasting), please see their in-store flyers or visit their website: www.nwwellness.com. Last year we had the pleasure of touring the beautiful garden at Willagillespie School. We met John Moriarty, the director of the School Garden Project there and had a tour, which included observing a class of very engaged third graders during their time working in the garden. As we watched, the kids learned about seed collection and carried out some of the tasks needed to take good care of the garden. The sun was shining, the kids were outside in the fresh air enjoying the fruits of their labors, and we fell in love with the School Garden Project all over again. The School Garden Project serves three of Lane County's school districts, 4J, Bethel and Springfield. Those districts include schools in urban and rural areas. There are around 1,000 students participating in school gardens through this program. Their programs vary from school to school and include a program within school day as well as after school programming. For some of us, it's hard to imagine a time when we didn't make the connection between fruit and vegetables and the ground. For many children, that connection hasn't happened yet. They know that food comes from the store, but they might not have thought about where it was before it got there. The School Garden Project makes the connections between dirt and food and our bodies concrete in a way that few other lessons could. By working in the garden from preparing ground for planting, to planting seeds, tending plants, and finally harvesting, kids get a sense of what work goes into growing our food. In addition, they get to experience the thrill of being rewarded for hard work. Finally, they are exposed to fruits and vegetables that they might not be eating regularly at home. There are so many wins for the health of our kids, our schools, and our planet, it's hard not to get excited about this wonderful program. For schools that are able to do garden classes through the school day, the School Garden Project provides a lead instructor, program volunteers and gardening and educational materials. Gardening classes often work within science curriculum. We are raffling off a Vitamix 5200 Blender, an overnight stay at Foris Winery and a gift basket to benefit the School Garden Project. Tickets are one dollar and the drawing will happen on Saturday, March 12th during our annual wine sale. When you support this amazing program, you won't believe all of the beautiful things that will grow. According to the Joslin Diabetes Center, "Good control of diabetes significantly reduces the risk of developing complications from getting worse." While people with diabetes have to pay attention and take care with their health, this disease is manageable and by no means a death sentence. Join Francie to learn more about how to control this disease while living a full and happy life. Valentine's Day is this Sunday! Whether you want to celebrate big or small, we have many excellent ideas to help make the day special. 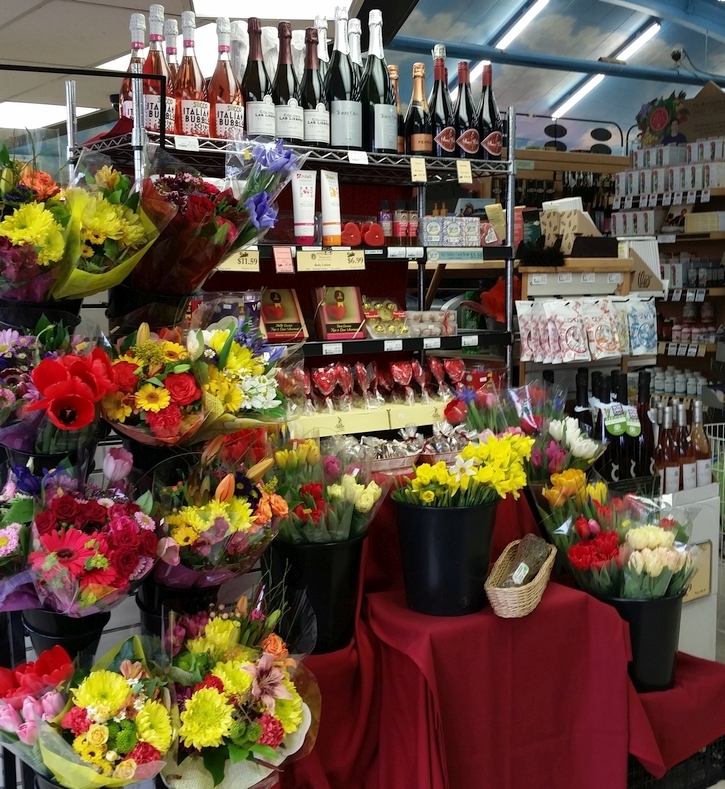 Our Produce department has a great selection of flowers, Grocery has many chocolates and other sweets to say I love you, Natural Health has products to help you shower your loved one with affection, and the Wine department has the perfect celebratory sip to accompany it all. Whether your perfect holiday includes lovely cheeses, fresh seafood, a bottle of wine or beautiful produce, we have products in every department to help you express your feelings. Happy Valentine's Day! Monday, 25 January 2016 Annual Citrus Fest this Sunday! Our Annual Citrus Fest will be this Sunday, January 31st from noon to 3pm. Please join us as we celebrate the very best citrus that our Produce Department has to offer. This event is a great opportunity to learn more about varieties of grapefruit, oranges and other citrus to find the ones that most suit your personal taste. Register to win a basket full of fresh citrus! The winner will be drawn at 3pm. See you Sunday! Citrus season is in full swing in our Produce Department, and we have many different options to satisfy your need for this edible sunshine. Among our many offerings are a few different varieties of grapefruit, and their ancestor, the Pomelo. Pomelos are larger than grapefruit, with a very thick green or yellow rind. The flesh inside is pulpy like a grapefruit, but without the tartness. Pomelos offer big doses of Vitamin C and fiber, as well as potassium, which eases muscle cramps and lowers blood pressure. The Cocktail Citrus, or Mandelo, isn't technically a grapefruit. It is, however, delicious, sweet, succulent, and an excellent juicer. Oro Blanco grapefruit can be either a beautiful pale green or a pale yellow. They are sweet and tender, seedless and very juicy. Mellow gold grapefruit are siblings of Oro Blanco. They are low in acid, and tend to be more like Pomelos than other grapefruit. Red Grapefruit are beautiful, sweet, and high in Vitamins A and C. They too are high in fiber, but also offer lycopene and beta carotene among their health benefits. If you are curious to learn more, please join us for our annual Citrusfest on Sunday, January 31st, 12-3pm. The New Year is often a time when we look at how we are living and think about what we want to change. The goal of those changes is sometimes health, or personal happiness, or a combination of the two. Our Nutritionist, Francie, has developed a series of seminars to help us learn how to live more healthfully. Whether you are trying to clean up your act after holiday indulgence, learn how to manage a life altering health issue, or planning for a long trip, Francie has good information about what we can do for our bodies to maintain and improve our health. All of the seminars will be held from 1:00 to 2:00 at Tsunami books (2585 Willamette St.). In the first of this four part series, "Detoxing from the Holidays," Francie will share information about what is involved with cleansing and detoxing, and what the potential benefits of doing so could be. This seminar will be held on Saturday, January 16th. 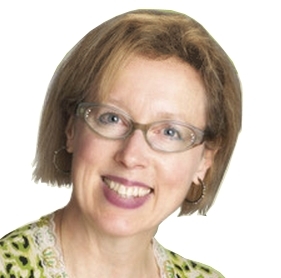 On February 27th, Francie's topic will be "Living With and Managing Diabetes." More and more of us are becoming diabetic, and while the diagnosis is frightening, once this disease in understood, it is often manageable. Francie will give information about the disease, and how inflammation can play a role in the health of a person with diabetes. Our March 26th seminar will be "Autoimmune Syndromes: Integrative Approaches for Management and Healing." Like diabetes, autoimmune disease diagnosis such as Crohn's, Lupus, and others are on the rise. These diverse and ever changing diseases can dramatically impact our lives. Treatments are challenging because no one thing works for everyone. Francie will talk about different options that have brought some people relief, including both Western and Alternative/Natural ideas. After a break in April, on May 21st Francie will give a talk about staying healthy while travelling. There are few things more depressing than getting sick during a much anticipated vacation. Francie will share tips and tricks for staying healthy and energized so that you can enjoy all that travel has to offer. There is a lot to celebrate this time of year. In our neck of the woods, one of the things to celebrate most fervently is winter seasonal beers. These beers are the perfect thing to bring to a party, to give as a gift, or to enjoy when you are cozy inside on a cold and rainy evening. We have two Ninkasi brews that would be a joy to give and a pleasure to receive. Critical Hit is a barleywine with a NorthWest twist. The citrus, earthy and grassy flavors have Port and Sherry notes. The finish is all hops, coming from the 16 varieties used in the brewing process. The combined bitterness pairs with a malt complexity for a non cloying finish. Barleywines are heavy weights when it comes to alcohol content, and Critical Hit is no exception, with an ABV of 10.4 %. D and D fans will be comforted to know that Critical Hit gives you 86 hit points, but be forewarned, your intelligence could be compromised. Another Ninkasi brew that is perfect for gift giving is Ground Control. This Imperial Stout is brewed with hazelnuts, star anise, cocoa nibs, and is fermented with yeast that has been shot into and returned from space. Yes, space. This delicious stout comes in a space themed gift box. We are selling it for $19.99. It's the perfect thing for every space loving beer drinker on your list. Calapooia Brewing's Kringle Krack is a Strong Ale brewed with Chocolate, Munich and Vienna malt. This brew offers cocoa, vanilla and licorice undertones, with a hoppy finish furnished by the Willamette and Cascade hops. With its seasonal flavors and not entirely safe for work label, this beer would be the perfect stocking stuffer. Pelican Brewing's Bad Santa uses Pale Ale malt, Melanoidin Malt, Dehusked Black Malt, Magnum and Fuggle hops to create a toasty brew with complex malt flavors and an herbal hoppyness. This beer promises to go down very easily, but fear not, we are assured that Bad Santa is neutral on the Naughty or Nice question. Laurelwood Brewing has produced a lovely brown ale in their Vinter Varmer. This English style old ale is rich and complex, with a spicy hop flavor and a roasty finish. A six pack of this ale will help dispel that seasonal chill. Finally, Cascade Lakes Slippery Slope is a full bodied and well balanced ale perfect for pairing with all of those hearty winter menu items. Whether you choose a seasonal beer or one of the many that we carry all of the time, you'll find an excellent selection in our Beer department. It's time again for our Neighbors in Need food drive! The holidays are a time of joy and celebration for many, but for some in our community it's hard to feel joyful when you are worried about feeding your family. Five years ago, after a regular customer made a suggestion, we created Neighbors in Need as a way of spreading comfort and joy to members of our community who need a little help. Here's how it works: We prepack two different sizes of grocery bags. When you come in to shop, you can choose to purchase either size bag. Pay for the bag at the front end along with your groceries and put it into the donation bin on your way out the door. All of the food donations are distributed through St. Vincent de Paul. 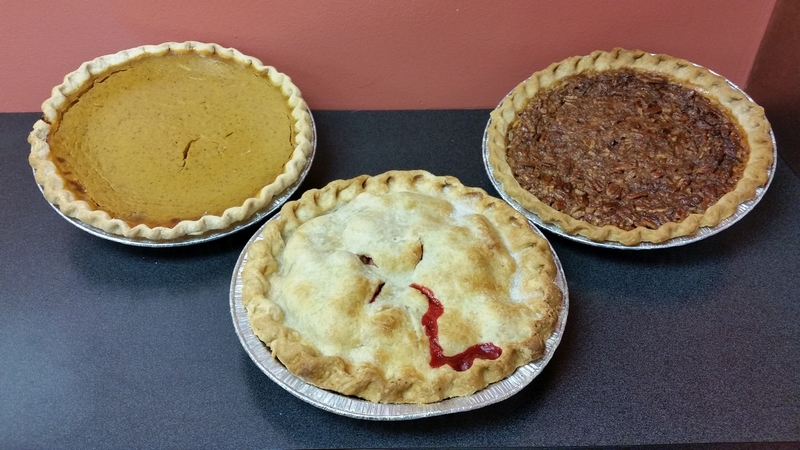 Wednesday, 20 November 2015 Thanksgiving Pies! As we head into Thanksgiving week, it's all about the details. Do you have enough sage? How's your supply of broth, butter and and cream? This epic and delicious meal is a lot of work, but it's hard to want to cut corners when you want everything to be the best. If you are a person who can't let go of the stuffing, or the mashed potatoes, or the cranberries, what about the pies? Home made pies are wonderful, but we have some excellent locally made alternatives if you want to focus your energies elsewhere. This year we are carrying pies from three different notable companies. Mom's Pies in Downtown Eugene produces both fresh and frozen pies made with local fruit and an all vegetable shortening crust, making most of their pies suitable for a vegan diet. We are carrying Mom's Berry Medley, Apple, Strawberry Rhubarb, Pecan and Pumpkin pies, both fresh and frozen. Our second local pie offerings are from Willamette Valley Pie Company. This Salem based company grows their own fruit and creates excellent pies. Our Willamette Valley Pie offerings are include Pumpkin, Pumpkin Chiffon, Cherry, Strawberry Rhubarb, Marionberry and Apple. Finally, for our gluten free friends, Silly Zak's Gluten Free Bakery offers excellent pies using a crust made primarily of rice flour. This crust is less flakey and more cookie like, and absolutely delicious. We carry Silly Zak's pies in Marionberry, Apple and Pumpkin. It goes without saying that we take pie very seriously. In order to be sure that we are offering only the best, we have done some extensive sampling. Strawberry Rhubarb, Pumpkin Chiffon and Berry Medley all get our stamp of approval. At Capella Market, we love food not just for its nourishment of our bodies, but for the way that the foods we carry nourish our lives. We are passionate about delicious, fresh, healthy and local products. We don't have to look far for others who share our passion. The Slow Food Movement shares our values for good, clean and fair food and beverages. Casa Bruno, LLC, has joined forces with eleven Oregon wineries to create Slow Pinot Noir, a blend of Pinot Noir grapes grown throughout the Willamette Valley. The profits from sales of this collaboration will go to Slow Food Portland. In a state rich in excellent vineyards, the eleven participating wineries share some commonalities. They are primarily "dry farmers," meaning that they don't irrigate their crops, and so are more at the mercy of the weather. 2014 was a fantastic year for Oregon Pinot Noir, with a long dry fall that allowed fruit to ripen in an ideal circumstance. Not only was the fruit of 2014 very high in quality, the yields from that crop were higher than usual as well, causing wineries to have extra fruit, more than enough for their own wine making needs. Following the Slow Food Movement's dedication to paying producers fairly, each of the participating wineries was paid somewhat better than market price for their fruit. Once the details and financing were figured out for the project, the next step was blending eleven excellent barrels into one outstanding wine. A tasting committee consisting of three winemakers and three Slow Food members evaluated the offerings and unanimously chose what has become Slow Wine Pinot Noir 2014. While this wine is priced at $29.99, we are offering it at the special price of $26.99. Slow Wine Pinot Noir celebrates so many things that we here in the Willamette Valley can be thankful for--beautiful hills covered in fertile soil, delicious grapes, and wine makers who know how to be good caretakers of their land. This wine is perfect for Thanksgiving. Thanksgiving is rapidly approaching and we are up to speed on all of the spectacular food and drinks that you will need for Thanksgiving and the rest of the holiday season. Our Holiday Tasting Fair is Saturday, November 14th. This event is a great opportunity to sample lots of delicious edibles that will help make your celebration complete. We'll be sampling cheese, wine, Silly Zak's gluten free pies, and almost all of the sides that our deli prepares for the Thanksgiving meal. What better time to stop by the Meat Department and reserve your turkey or spiral cut ham? We all have our favorite parts of the holiday meal. Some people are crazy about the turkey, others the stuffing, still others the green beans, the mashed potatoes or the cranberries. While preparing some of these components might be a pleasure or a labor of love, almost everyone who celebrates Thanksgiving looks for some way to ease the burden of creating every dish. Our deli offers high quality, well prepared sides that will give you a chance to focus your attention on the parts of the day that matter most to you, whether it be a walk with friends, more time to devote to other dishes, or even, dare we say it, a nap while the turkey is in the oven. Our Holiday Tasting Fair is Saturday, November 14th from noon to three. We're on the verge of November, and our Meat Department has started taking orders for fresh Thanksgiving turkeys from Diestel Turkey Ranch. Diestel turkeys are raised humanely, with plenty of room (indoors and outdoors), and are fed an all-vegetarian diet which never contains antibiotics, growth enhancers, hormones, gluten, animal by-products or dried distillers grains. Diestel mills their own feed, sourced from high quality corn and soy. They use different turkey breeds so that all the birds are fully matured at their natural weight. Diestel Turkey Ranch has achieved a GAP 5+ rating under the Global Animal Partnership animal welfare rating system. These are delicious birds, slow-grown to high standards in a natural environment. To ensure that your Thanksgiving table will be graced by one of these excellent turkeys, call 541-345-1014 today and ask for the Meat Department. 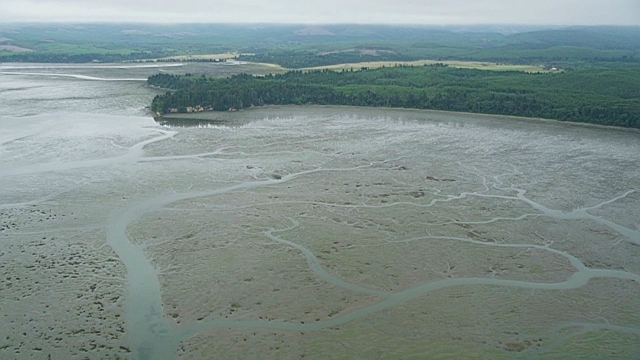 Southwest Washington's Willapa Bay is renowned for its beauty and biodiversity, but also for producing about 9 percent of the oysters consumed in the United States. We are excited to be offering a 10 ounce jar of Willapa Bay oysters on sale in our seafood department for $4.99, through November 10. Researching oysters led us to this helpful website for all things seafood, which is a great resource for questions concerning seafood consumption and health and safety. There's a chill in the morning air, the leaves are falling, and our beer case is full of early fall seasonal beers. While much of the America is wild for pumpkin spice, our seasonal beer offering includes a variety of fall flavors. If you are a pumpkin lover we offer two options. Uinta's Punk'n Harvest Ale features fresh pumpkin and seasonal spices, with a hint of vanilla and honey. It pairs well with all of our favorite fall ingredients from squash to pumpkin ravioli to anything that includes cinnamon, nutmeg and cloves. Ninkasi has created a fall offering by combining each batch of their winter seasonal, Sleigh'r, with brown sugar and 300 pounds of organic pumpkin. Combined with Sleigh'r's toasted hops, Imperial Pumpkin Sleigh'r offers a sweet aroma, smooth mouth feel and a warm finish. We are offering a few fresh hopped seasonals, one from Gilgamesh Brewing, called Fresh Prince of Ales. Fresh Prince is wet hopped with a huge number of fresh Centennial Hops. It has citrus and floral notes, a brief hint of bitterness, and a strong aroma. Hale's Ales has created Fresh Hop, using fresh Cascade hops, barley and oats. Fresh Hop has a citrus sweetness and a dry finish. Cascade Lakes Brewing Co. brings us Slippery Slope, a smooth ale brewed with Crystal malt and generous amounts of Cascade hops which creates balance in this seasonal ale. Slippery slope is brewed with a touch of chocolate and honey. Finally, Sierra Nevada has created Narwhal Imperial Stout, which has a rich malt flavor, with espresso, cocoa, roasted grain, and a touch of smoke. This stout is malt forward and smooth. We'll have more seasonal beers coming in throughout the season. What's different about the holidays? Usually, it's more stress! In addition to our regular day-to-day obligations of work and home life, we have less time since days are shorter, plus we have more obligations with extra shopping, social events, and often-times more financial stress. Plus, it can be a real challenge to keep up healthy eating patterns since it can be tempting to just skip a meal due to time constraints, possibly justifying it by thinking of calorie savings that can be blown on holiday treats. Our bio-rhythms often take a turn for the worse this time of year, which can be another added stressor. We feel more like hibernating during the short gray days, and often feel like indulging in carbohydrate-rich foods. Sleep patterns and mood problems may further complicate the situation. So, what steps can we take to help normalize our stressed out minds and bodies , and help make the intent of seasonal joy more of a reality? 1) First, did you know that the two main ways to control or eliminate carb/sugar cravings are to get enough protein and to get some regular exercise every day? Both will help stabilize your blood sugar levels, and the exercise will oxygenate your cells, wake up your brain and boost energy levels. How do you know if you're getting enough protein? If my clinical experience is any indicator, most people do not get enough protein on a daily basis. The way to think about this is, since our diets are composed of protein, carbohydrates and fats, the total equals 100% of our calories. So we then need to break down these macro-nutrient categories into percentages of that 100% total. There is more that one way to do this, of course, but in general, 20-25% of calories should come from protein, 45-50% from complex carbohydrates and 25-30% from fats. If we use a caloric estimate of 1800 calories daily, this translates into 90 grams of protein at 20% of calories. Getting this amount of protein daily may look something like this: a morning protein drink equals 25 grams protein, a lunch salad with 4 oz tuna = 20 grams protein, dinner with 5 oz of chicken equals 35 grams. A snack of a good protein bar and another snack of fruit and nuts may equal about 15 protein grams. Grand total equals 95 grams for that day. Any less protein will automatically raise your carb percentage, thus de-stabilizing your blood sugar and increasing body/mind stress! People can assimilate about 30-35 protein grams at one time, so reaching the 20-25% protein goal should not be difficult. You will be healthier, more energetic, and will notice better brain function. Remember, too; that we need more protein as we age, not less! 2) It can be more difficult to feel inspired for exercise when it's rainy or cloudy outside. But making the effort to prioritize exercise into your daily routine will pay numerous quality of life dividends! Morning is best as you get it out of the way, you'll burn more calories the rest of the day and you will find that in combination with eating every 3 hours and combining the right amounts of protein with complex carbs and healthy fats, it will be much easier to resist holiday indulgences, as they simply won't look appealing. And don't forget the water! Do not count caffeine or alcohol drinks as part of your 64 oz daily goal, but herbal tea without caffeine is fine along with water, or water with lemon or lime. a) Adrenal/Mood Support: Phosphatidyl Serine, Gaia Adrenal Support. b) Digestive, eliminative support: Enzymedica brand has a wide variety of specialty digestive and systemic enzymes.. 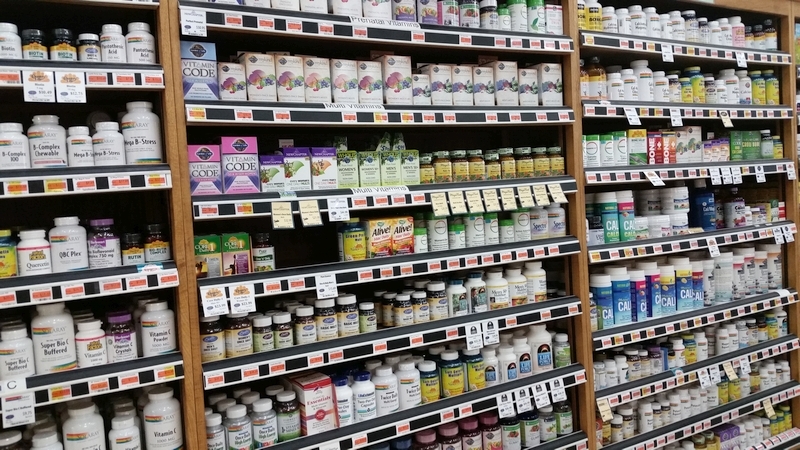 Among them are Digest Gold, Gluten-Ease, and Acid-Soothe.. Come to the Natural Health Department and speak with our knowledgeable staff about which product would be best for your needs. c) Protein Powders; Capella has a wide variety of low carb, vegan and whey based products. To keep up your daily protein, one of these should be a staple in your daily diet! d) Immune System; Wellness Formula, Umka Cold Care, Olive Leaf extract, and Super Immune Plus are some of the many excellent choices to help keep you and your family healthy and deal with your cold and flu symptoms naturally. JOIN FRANCIE ON SATURDAY, OCT. 24, 11AM, FOR A FREE TALK ON THIS SUBJECT, AT TSUNAMI BOOKS, 2585 WILLAMETTE ST.
Thursday, 1 October 2015 Nearby Nature: Garden Wagon Raffle! Nearby Nature was created in 1992 with the goal of educating Eugenians about nature close by and ecological living. In the past 23 years, their many programs have educated thousands of locals, mostly kids, on the natural world that's right outside our back doors. Located in the Wilhamut Natural Area in Alton Baker Park, Nearby Nature offers easy access to a wide variety of trees, plants, animals and ecosystems. The Willamette River, bike paths, walking trails, a filbert orchard and many trees offer opportunities for ecological education. Along with their summer camps and non school-day programs, Nearby Nature puts on special events such as their Haunted Hike. The 19th annual Haunted Hike will be on the evening of October 24th this year. Nearby Nature guides will lead tours of the Alton Baker trails. Their paths will cross with furry and feathered costumed creatures who will entertain and educate young nature lovers. To support Nearby Nature and all of their programs, we are raffling off a handcrafted wagon. This wagon is built for hard working fun, with inflatable tires and a weight capacity of 800 pounds. 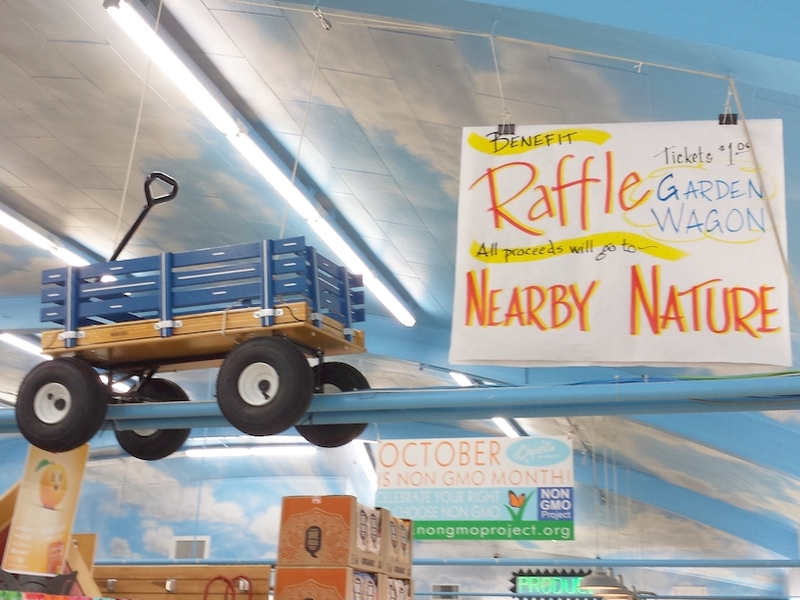 Raffle tickets are one dollar each, and the drawing will be held on October 17th, when Nearby Nature will be here at the store during our Squash Tasting, noon-3pm. It seems that the long hot summer is finally behind us, and we are easing into fall. As the season changes outside, it's changing in our store. The deli menu is shifting, the meat department is moving from grilling to roasting, and, in produce, melons are easing out while winter squash and apples are pouring in. Squash is a nutritional powerhouse. It is rich in fiber, potassium, Vitamins A, C, and B2, B3 and B6. While we carry the comfortingly familiar Butternut, Acorn, Spaghetti and Delicata, we also carry beautiful varieties such as Red Kuri, Kabocha, Buttercup and Blue Ballet. The nice thing about this Mark Bittman recipe is that it works with any winter squash. This Martha Stewart recipe uses a small amount of brown sugar to highlight the natural sugars in acorn squash. Winter squash varieties store well, work in many different dishes, and offer color on fall menus. First, at nearby Tsunami Books (2585 Willamette), our new clinical nutritionist and metabolic health specialist Francie Killian will present "Why You May Be Better Off Without Gluten." In this lecture, learn how gluten can promote inflammation and lead to obesity, food addictions, digestive problems, autoimmune disease and other illnesses. What can a healthy gluten free diet look like? What is the difference between an allergy and intolerance? How can gluten initiate "leaky gut," and why is it considered among many health experts to be the biggest dietary gateway to disease? Back at the store, from noon to 3pm, we'll be serving up tasty samples of gluten free foods, and several of our favorite gluten free food makers will be here giving demos and answering your questions. From September 16 through 29, all our Supplements Department products are 20% off retail price (while supplies last, not further discount). Come on in and take advantage! I have a Master of Science degree in Health Education and a Bachelor of Science degree in Gerontology, both from the University of Oregon. My emphasis is on healthy aging throughout the life cycle, and helping people learn how best to adapt to changing needs. I began my career in health and wellness at a local natural food store during my college years and to date have spent about 25 years in this industry in a variety of positions. I'm also a clinician, specializing in detailed blood chemistry analysis, fitness management, body-composition testing, and personalized wellness programs. I am available Tuesdays-Saturdays, 1-5 pm, for in-store assistance, store tours and nutrition-related questions. I can help new and regular customers shop efficiently, read and understand product labels, and manage gluten-free shopping--saving you time and money. 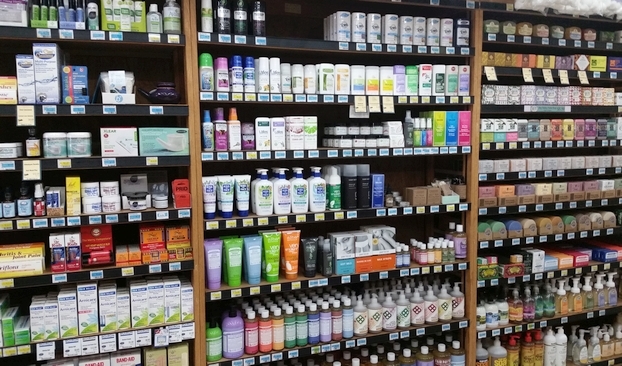 We have devoted two whole aisles to nutritional supplements, vitamins, homeopathics, herbal tinctures, and cruelty free body care products, including hair care & colors, cosmetics, toothpastes, deodorants and more. Our seven Natural Health department staff members collectively have many decades of experience in the health and body care retail field. Their helpful and friendly expertise is available to you every day between 8 a.m. and 9 p.m.
With the shorter days of Fall fast approaching, now is the perfect time to begin thinking of ways to economize your time during this busy season. With colds and flu just around the corner, preparing simple and healthy dinner meals that freeze well will go a long way toward lowering your daily stress and boosting your immunity. How do you find the time to cook and freeze ahead? Like anything else important, it has to be a priority. Plan out one or two days on your schedule, and have the ingredients on hand (including good freezer wrap!) for two to four dinner entrees. Economical and tasty selections may include chili, meatloaf, stew, salmon patties, veggie burgers (Capella Market has several yummy selections, and many are gluten-free), enchiladas and Mexi-casserole. These can be your core meals and since countless recipe modifications abound online and in cookbooks, there is no reason to get tired of them. You may want to limit your family to eating these frozen meals to maybe three times a week so that you can take advantage of fresh selections available with meat and seafood. Just add one or two vegetable selections to each entree and you're good to go! Maintain your freezer supply by reserving one day a month for cooking one or two entrees, making sure you date and rotate for best quality. We've all heard it... "Breakfast is the most important meal of the day." And now, recent studies support the idea that it is indeed healthier to eat most of your calories early in the day rather than later. People who eat more of their daily calories at breakfast instead of at dinner lose significantly more body fat than those who either skip breakfast or just have a light, high-carb snack for that meal. Here are two articles that give more information: Article 1 from livescience.com, Article 2 from washingtonpost.com. . You're not hungry in the morning, you say? Mix up a quick and healthy protein drink with one of Capella Market's many selections in the Natural Health department (Aisle 4). A good way to make it more tasty and healthy is to add the protein powder to one of Capella Market's many milk substitutes, then add a tablespoon or two of peanut, almond or sunflower seed butter. This way, you have all the main food groups--protein, carbs and fat, and it took all of maybe 5 minutes to make! Although it can be more challenging to avoid caffeine, sugar, alcohol and processed foods during the holiday season, your immune system will reward you with better health, energy and sleep if you minimize these substances as much as you can! Although your diet should form the foundation for your health, supplements targeted for specific needs should also play a big part in achieving and maintaining your health and well-being. When our bodies are under stress, our adrenal gland produces more of the hormone cortisol. Too much production of this stress hormone wreaks havoc with our health because it lowers our immune response. Capella Market carries a nice selection of adrenal support products. Benefits may include improved resistance to viruses and bacteria, better sleep and energy, and improved cognition. For those times when you need more targeted immune support, be sure to check out Capella Market's extensive immune support section on Aisle 4. Numerous choices abound for adults and kids and our friendly, knowledgeable staff will be happy to help you. Because we love the Science Factory, and we love kids, and we also love ice cream, on Saturday, August 29th, we are hosting an ice cream social and holding a raffle to benefit the Science Factory. Our raffle prize is a Burley Solstice Jogging Stroller. 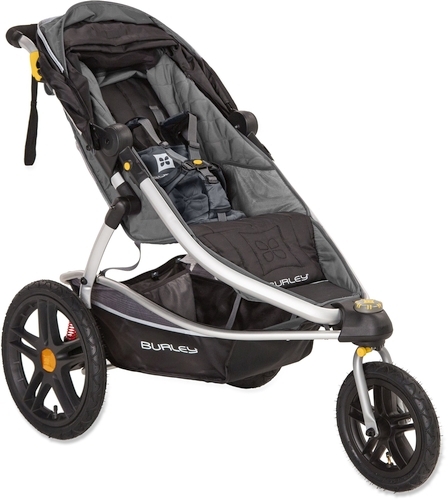 This stroller, a $399.00 value, is a new and excellent product from our friends at Burley. "The Solstice folds easily with one hand, has a lockable fron swivel wheel and features Spring Integrated Technology (S.I.T.) seating for hassle-free loading and unloading." Tickets are one dollar each and are on sale now. The Science Factory will be here with activities for kids, and we will be selling scoops of Lochmead ice cream and Coconut Bliss naked coconut and giving all proceeds to the Science Factory. The Science Factory's goals are: Scientific Integrity, Learning, Respectfulness, Collaboration, Sustainability and Accessibility. In addition to their temporary and continuing exhibits, the Science Factory runs programs in their Exploration Dome throughout the year. The Science Factory is the only children's museum in Lane County and the only General Science center in Lane and surrounding counties, and we believe that the work they do with the kids in our community is important. In addition to the Exploration Dome, the Science Factory offers a huge variety of Summer Camps and no-school day programs for kids ages three to eleven and above. With camp topics ranging from Eco Science to Kitchen Chemistry to Mini Med School, the Science Factory is teaching kids in our area important and fun things about the world we all live in. We hope you'll join us in supporting them! Combine 1/2 cup mint, lemon rind, 4 teaspoons lemon juice, 1/4 teaspoon salt, pepper, and garlic in a shallow dish; add tuna, turning to coat. Cover and refrigerate 30 minutes. Combine 1/4 teaspoon salt and water in a medium saucepan; bring to a boil. Stir in barley; cover, reduce heat, and simmer 30 minutes or until liquid is absorbed. Remove from heat; cover and let stand 5 minutes. Spoon barley into a large bowl; cool slightly. Add remaining 1/4 cup mint, tomato, green onions, capers, and olives; stir well to combine. Combine remaining 1/4 teaspoon salt, remaining 2 tablespoons lemon juice, and oil, stirring well with a whisk. Drizzle over barley mixture; toss gently to coat. Set aside. Place tuna steaks on a grill rack or broiler pan coated with cooking spray; cook 2 minutes on each side until tuna steaks are medium-rare or until desired degree of doneness. Spoon about 1 1/2 cups barley mixture onto each of 4 plates; top each serving with 1 tuna steak. As we gear up for the annual Capella Market Beer Sale (20% off all beer, hard cider and mead), it seems like a good time to take stock of this summer's seasonal options. Two trends that we are seeing are fruit infusions and cans. Mazama Brewing has chosen pineapple to play up the tropical aspects of their summer brew. Tepache Radler is a Belgian style wheat ale with pineapple, cinnamon and piloncillo (an unrefined sugar). Radlers are a mixture of fruit juice and beer, and have a lower alcohol content. The Tepache Radler has an alcohol content of 4%, and comes in a 22 oz. size. The lower alcohol content and the fruity flavor make for an easy drinking beer. In addition, Mazama has released two brews in cans, Fresh Mosaic Eruption and Wizard Island Wit. New Belgium has introduced Skinny Dip for your summer drinking pleasure. This easy drinking lager infused with peach juice and four different kinds of hops has all of the sunny flavor and refreshing pucker of your favorite summertime beverage. Rounding out our fruity summer offerings is Lagunitas' Citrusinensis. Using concentrated Sanguinello blood oranges in combination with a wheatier version of their New Dogtown Pale Ale, Lagunitas has produced a different spin on a citrus beer. It packs a comparative punch with an AVG of 7.9. We Northwesterners like our hops, and Oakshire is all about giving the people what they want with their seasonal Hopollo 7. Using Sorachi Ace, Cascade, Calypso, Nugget, El Dorado and Chinook hops throughout the process from bittering to dry hopping, Oakshire packs a hoppy punch in each bottle. 3-6 WildCraft Cider Works, Sun River Brewery, Pelican Brewing Company, Mazama Brewing, Fire Mountain Brewery, Lagunitas Brewing Co. If you are a chicken eater, you'll notice a change in our meat department in the next few days. We are switching from Petaluma Poultry chicken (Rocky and Rosie) to Draper Valley Farms. Draper Valley has been growing chickens in Washington State since 1935. We are excited to offer you chickens from a source closer to home. If you were happy with Petaluma Poultry, rest assured that Draper Valley is of the same fine quality. Draper Valley is antibiotic free, no hormones or preservatives are added, and the chickens are fed an all-vegetarian diet. The chickens are responsibly raised in spacious housing with natural light and ventilation and access to the outdoors. We are carrying both Organic (fed an all-vegetarian, GMO-free organic diet) and Free Range (Ranger brand) varieties. In addition we carry excellent Havurah Farm chicken, which is pasture raised on a family farm in Springfield. Whatever your preference, we have your chicken needs covered! It's our great pleasure to partner again with Cascades Raptor Center during their Family Nature Discovery Days events. Capella Market will be sponsoring the July 26th Wildlife Play Hospital event in which kids rescue an "injured" stuffed animal and help it onto the road to recovery. The Cascades Raptor Center's mission is to rehabilitate and release orphaned, sick and injured birds back into the wild whenever possible. In addition, they educate the public about the habitat those birds occupy. In addition to sponsoring the Wildlife Play Hospital, we are raffling off a Weber Charcoal Kettle Grill. Tickets are one dollar and the drawing will be held at the end of our beer sale on July 18th. That Saturday from 12 to 3 we'll have a hot dog barbecue with an all beef hot dog, chips and a soda for three dollars, or two hot dogs for five dollars. All proceeds for both the raffle and the barbecue will go to the Cascades Raptor Center. There will be lots of beer tastings, and, best of all, Dmitri the Eurasian Eagle Owl will be inside at customer service. Join us on Saturday, July 18th to support the Cascades Raptor Center. It's for the birds!